Welcome to Thread It Thursday!! 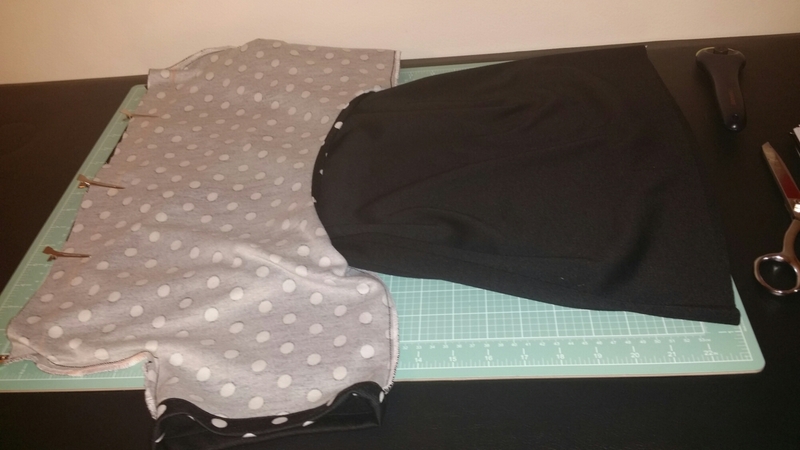 This sewing project came about as a way to use up some of the leftover fabric I have from other projects. I dislike having tons of scrap fabric left over and sitting in my fabric stash. So I make it a mission to find something useful to make with it. So let’s jump in and get started. 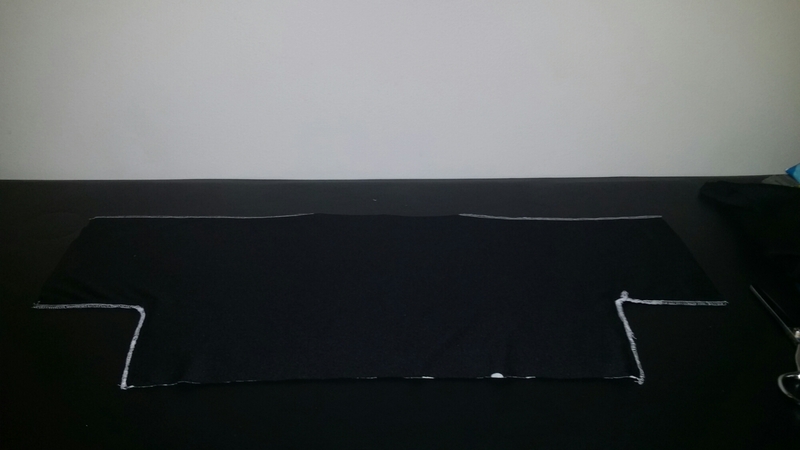 Take your t-shirt and fold it 2″ below the armpit. Pin to secure into place. Place your fabric pretty side down and lay your shirt on top. Once everything is traced cut it out. You will end up with this. Now fold your solid fabric in half (wrong side of the fabric facing you). Next fold the piece we just cut in half. 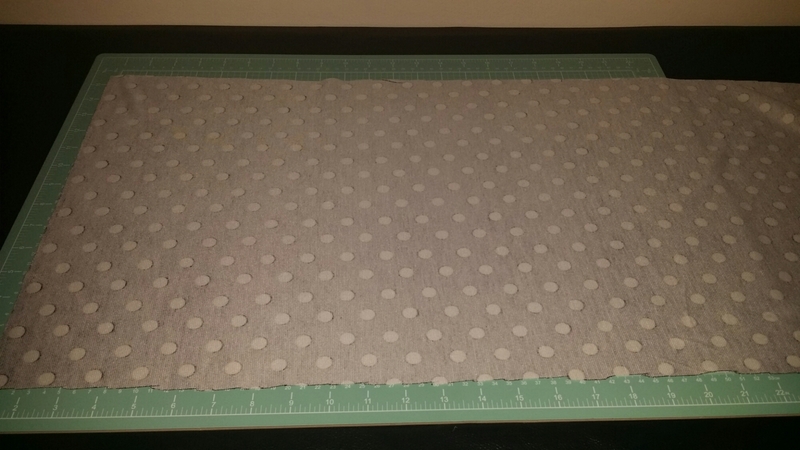 Lay it on your fabric and cut around. No extra seam allowance is needed. You will have two pieces. 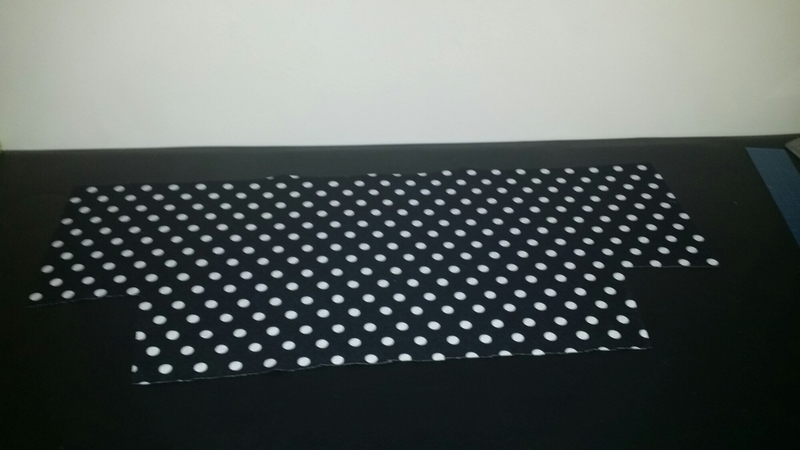 Next lay your printed fabric (polka dot) pretty side facing you. Time to cut the neckline. 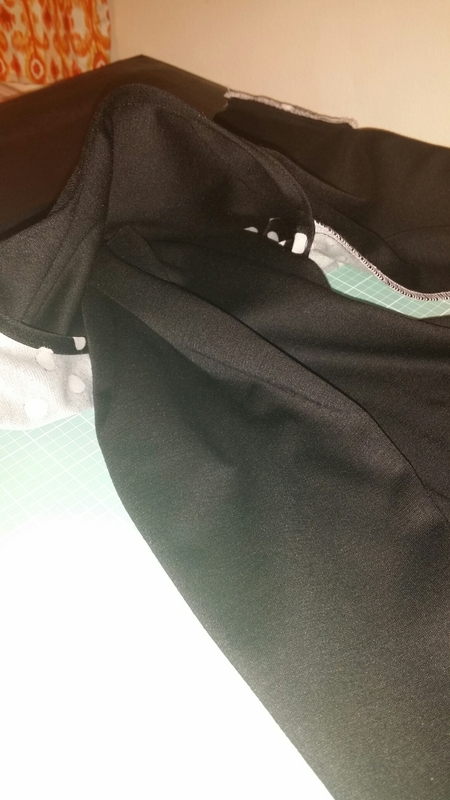 Fold the bodice we have just created in half. 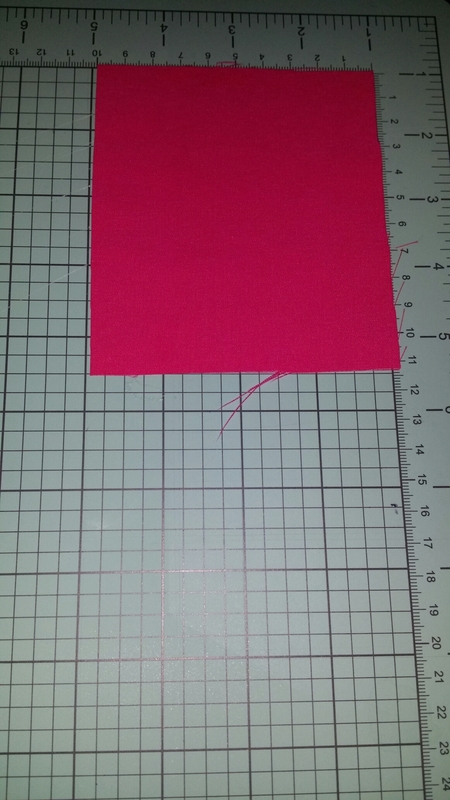 Measure down 1/2″ and cut. 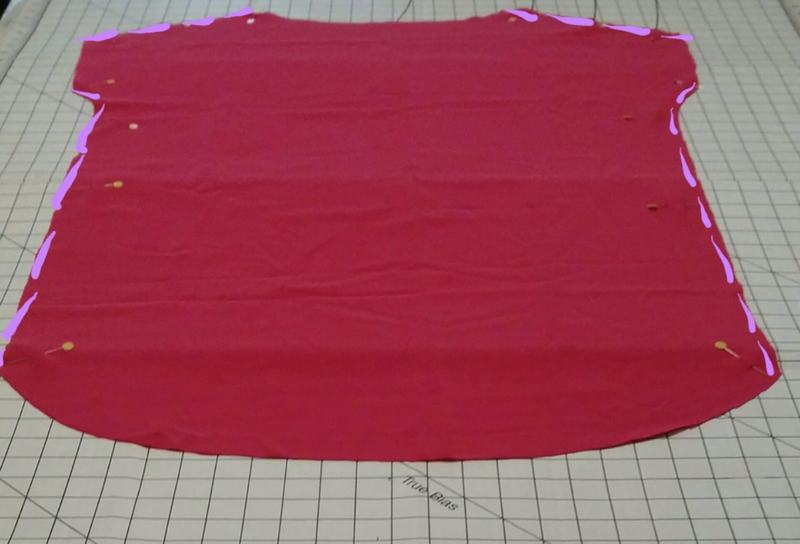 Once you have finished cutting turn the garment right side out. 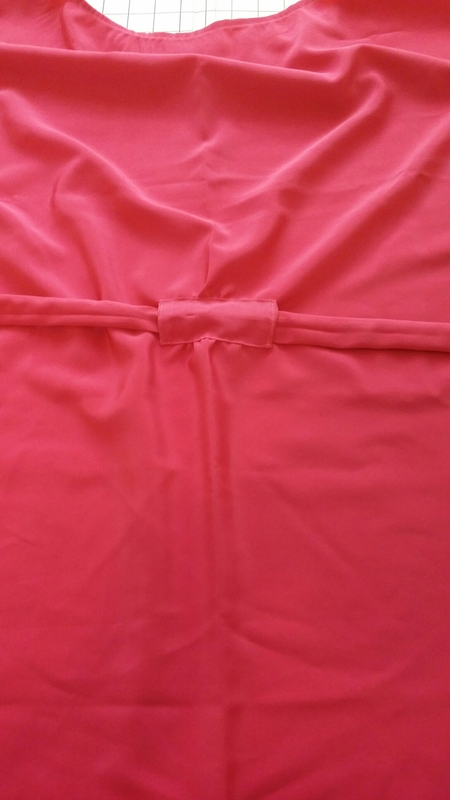 Hem the neckline fold over 1/4″ and then another 1/4″ pin. 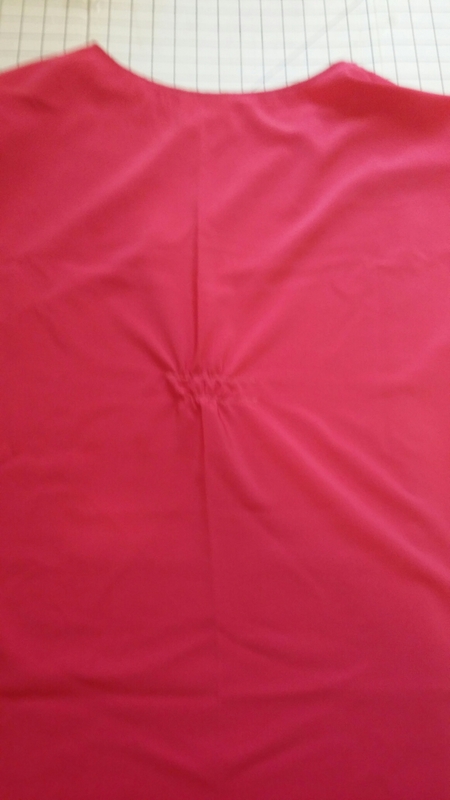 Hem, the sleeve fold over 1/4″ and then 1/2″ pin and sew. 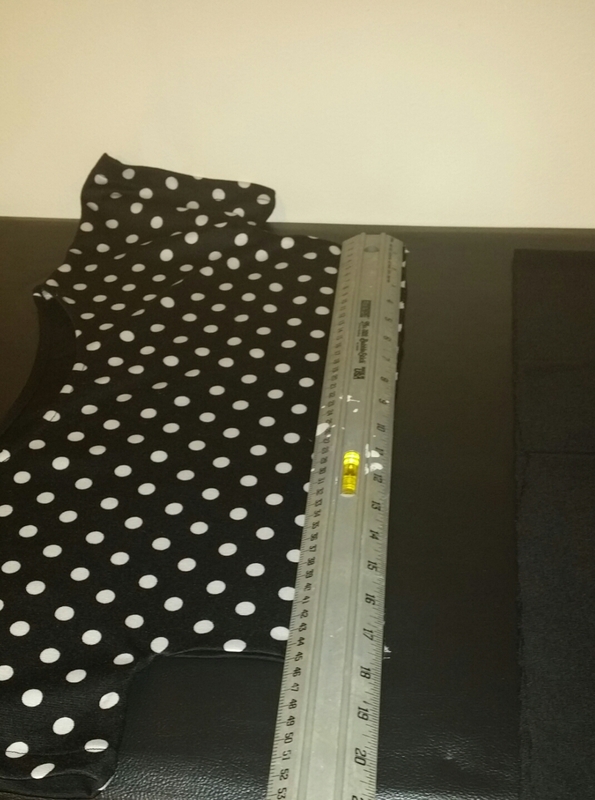 Now measure the bottom of your bodice. 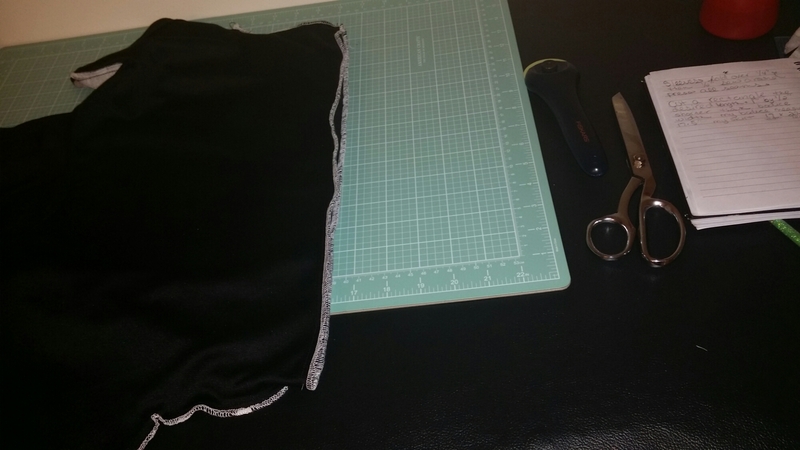 Next sew with a 1/2″ seam allowance and finish the seam. It’s time to attach the bodice and skirt. 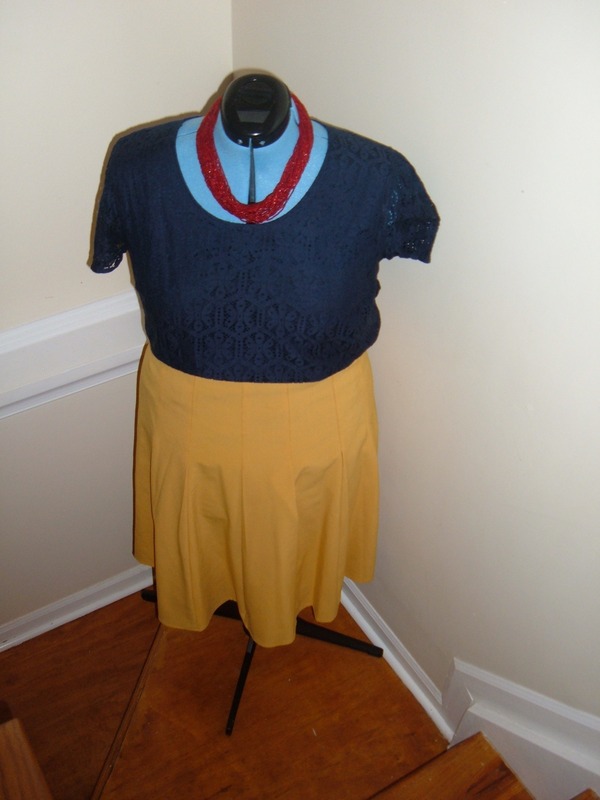 Turn the skirt right side out and your bodice should be inside out. 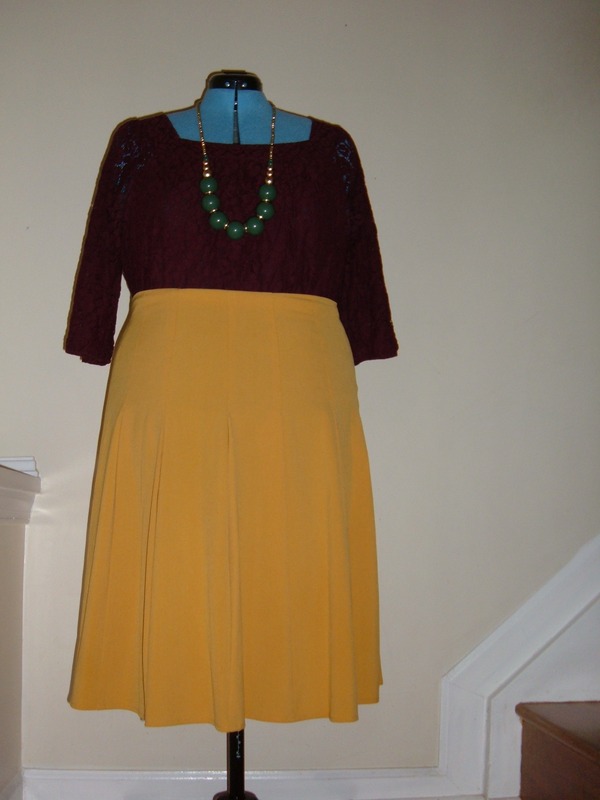 Push the skirt through the neckline. 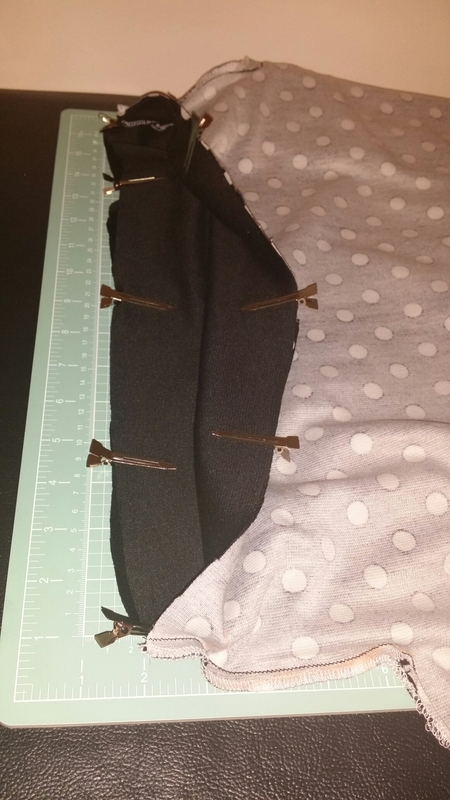 Align the top of the skirt with a bottom of the bodice and pin all around. 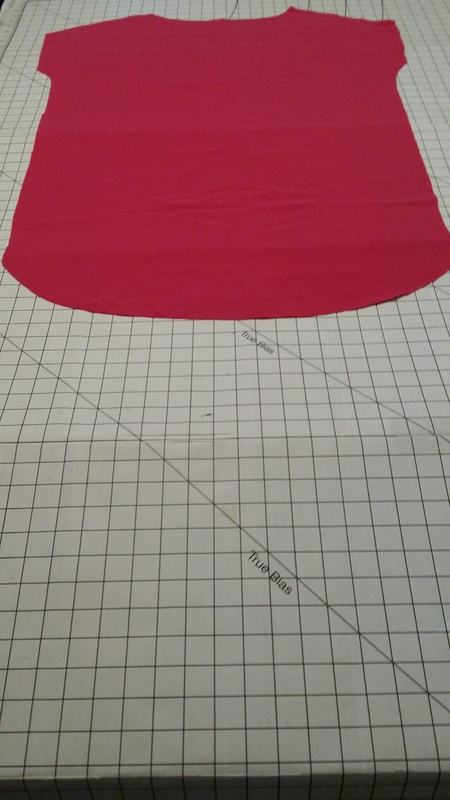 Make sure the side seam of the skirt and the bodice are aligned. 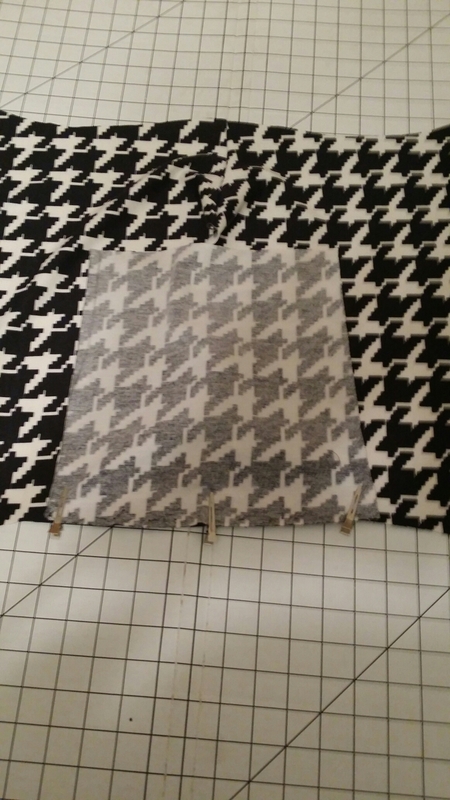 Sew around using a stretch stitch or small zig-zag stitch with a 5/8″ seam allowance. 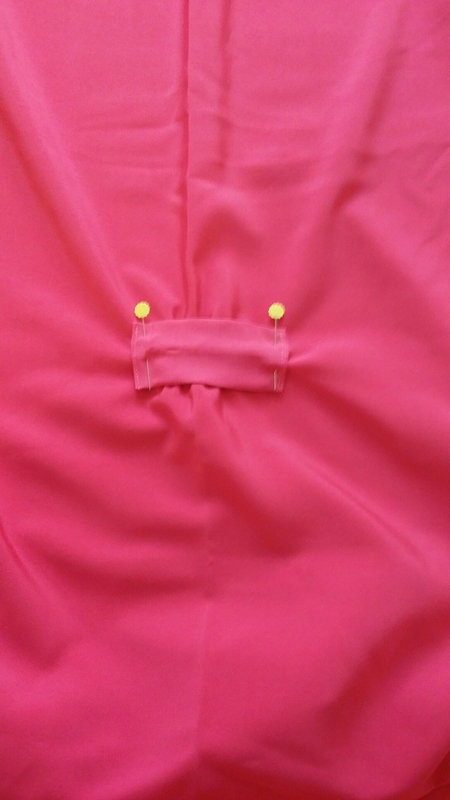 Finish the seam and press the seam upward towards the bodice. 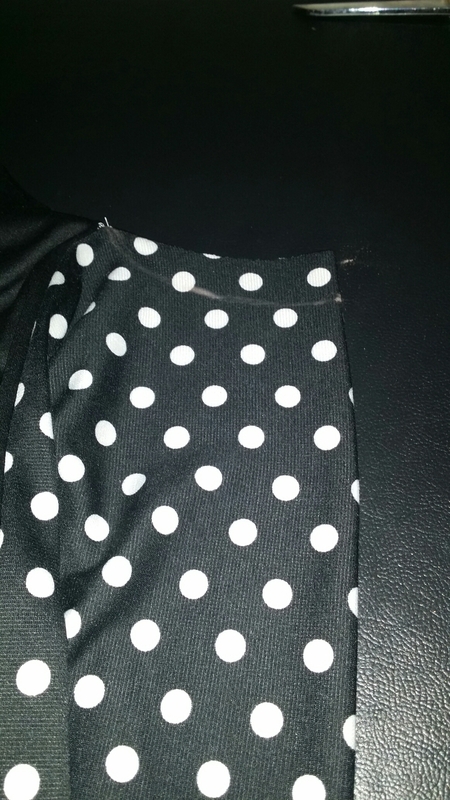 Hem the bottom of the dress by folding over 1/2″ and then another 1/2″. Turn the dress right side out and give the dress a good press. Thank you so much for stopping by, I greatly appreciate it. I have been taking full advantage of my motivation to sew. 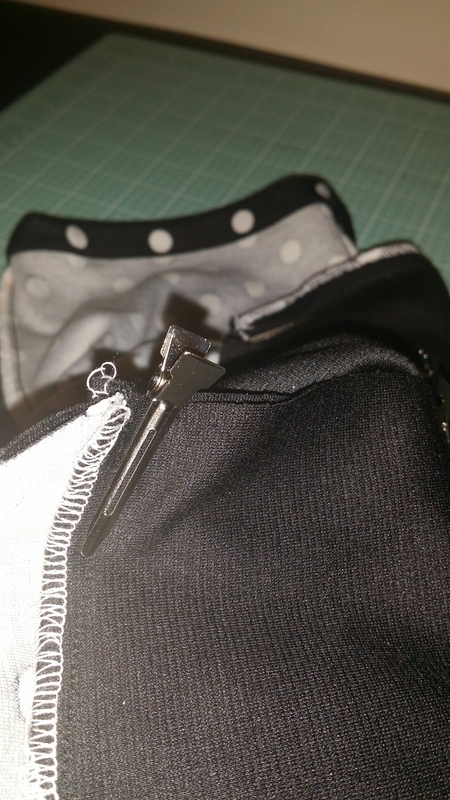 I must admit there are moments when I suffer from sewing burn out….even though I love it so. 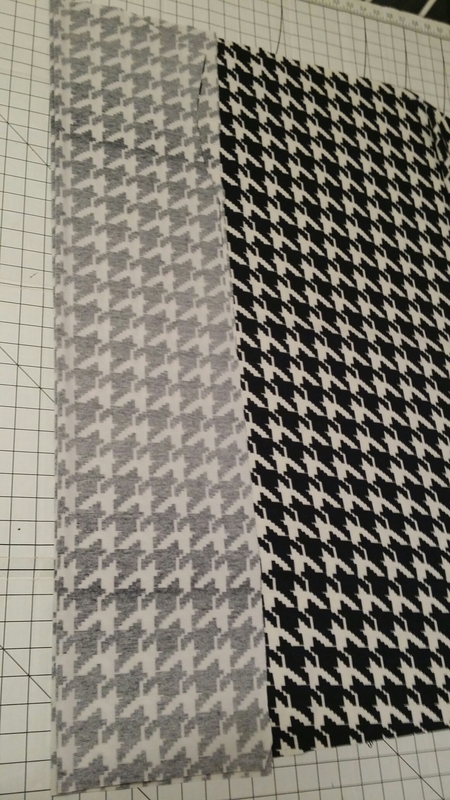 Having great fabric really helps to pull me out of my sewing slump rather quickly, though. So let’s jump right into this sewing tutorial. 1. 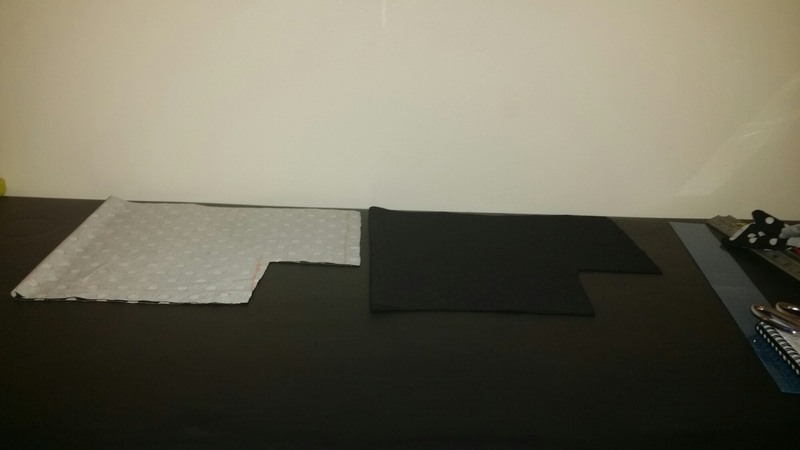 Lay your fabric as shown below. 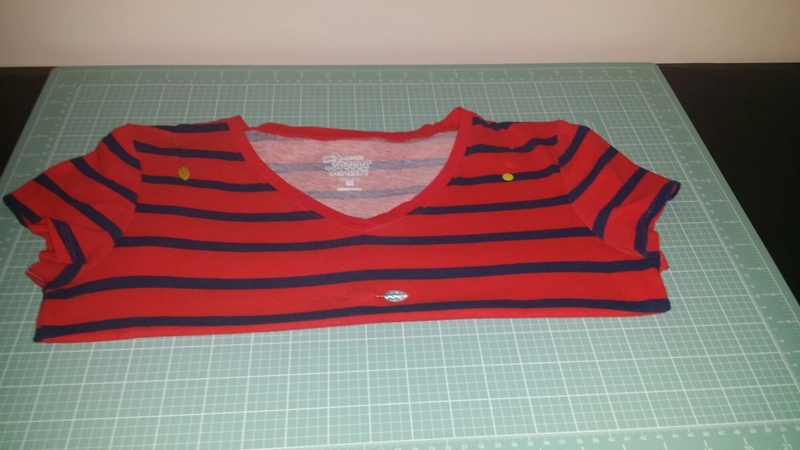 Cut 1″ away from your t-shirt and down to the desired length. 2. 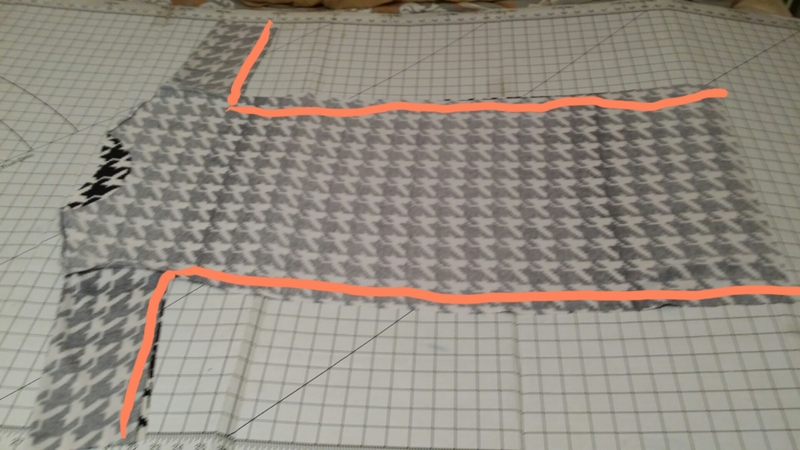 Now fold your fabric so you can cut out your second piece. Lay the 1st piece you cut out on top and cut around. No extra seam allowance needed. 3. Now it’s time to trace a sleeve. 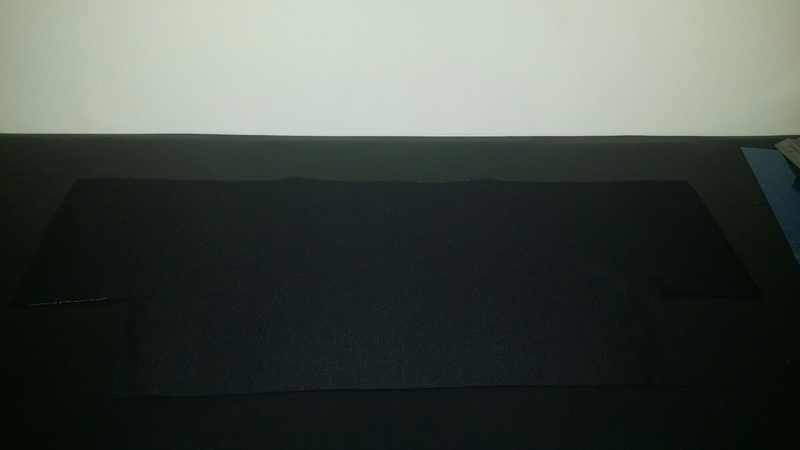 I forgot to take a picture of this step so I had to improvise. 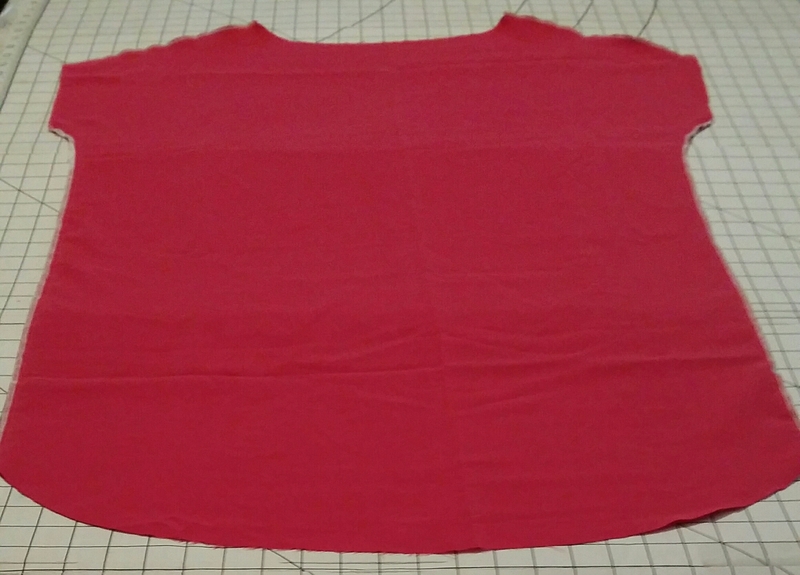 Trace the sleeve of the shirt you’re using adding a 2″ seam allowance all around onto pattern paper or whatever type of large paper you have on hand. 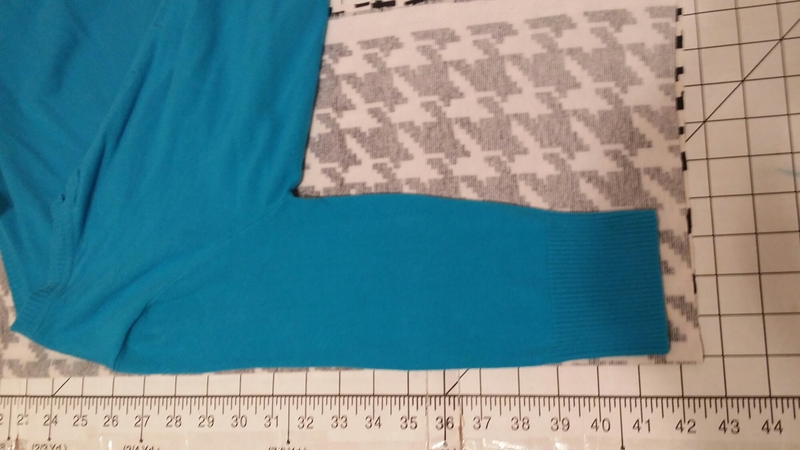 Remember that you will need to extend the length of the sleeve to the desired length if using a short sleeve shirt or reduce the length if using a long sleeve shirt as your sleeve pattern. 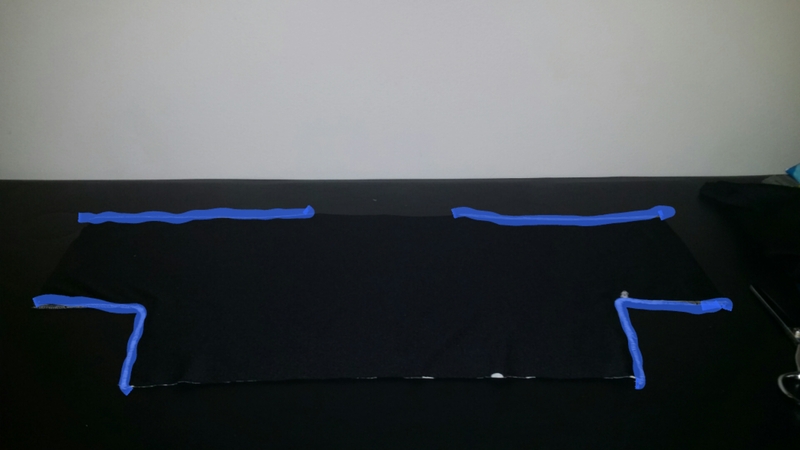 Fold your fabric in half with right sides facing and the wrong side facing you. Place pattern on the fold and cut out the sleeve. Repeat for the second sleeve. 4. 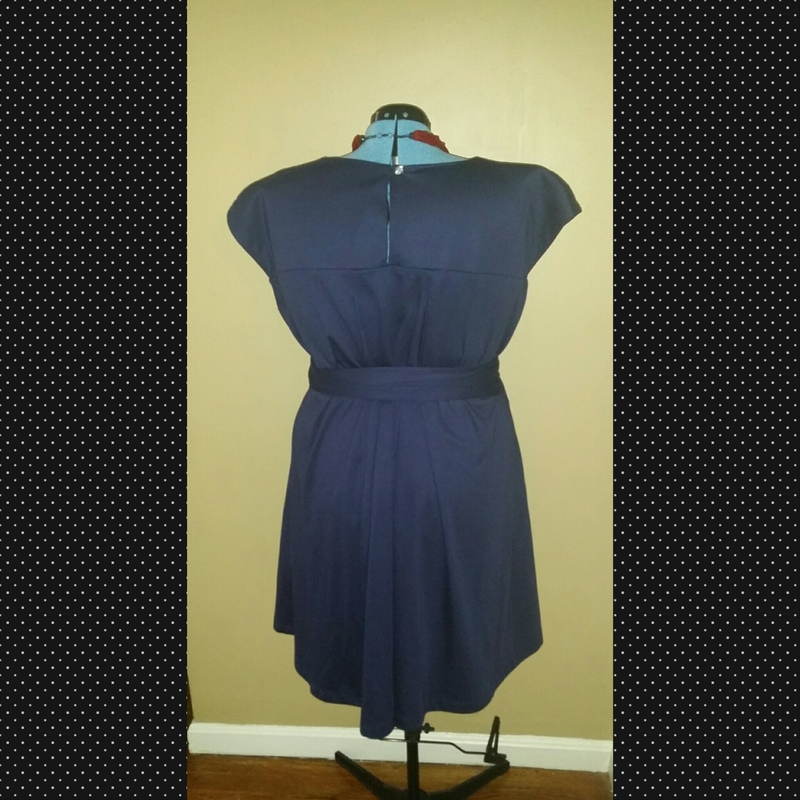 Now take your dress and lay it with right sides facing and pin along the shoulder. 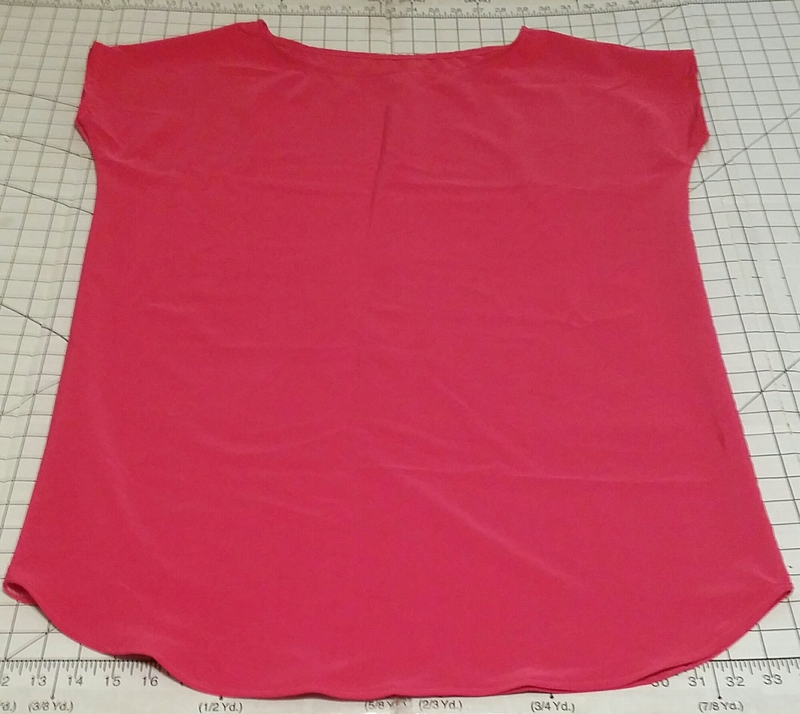 Sew the shoulder’s using stretch or small zig-zag stitch and a 1/2″ seam allowance. 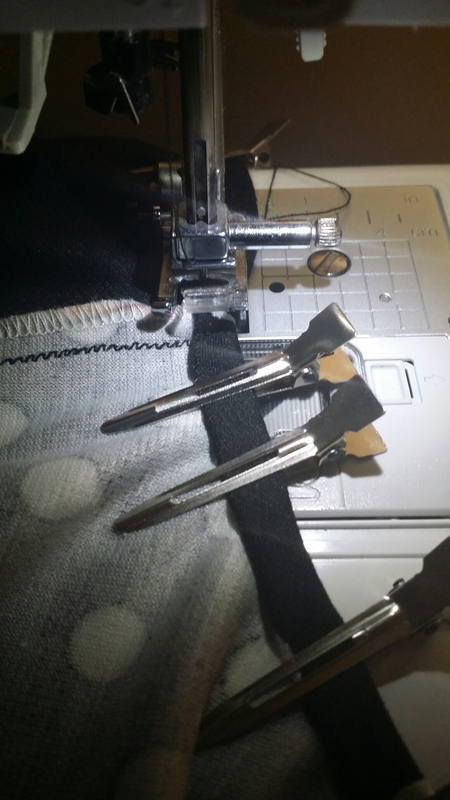 Finish your seams with a serger, pinking shears, or regular zig-zag stitch. 6. 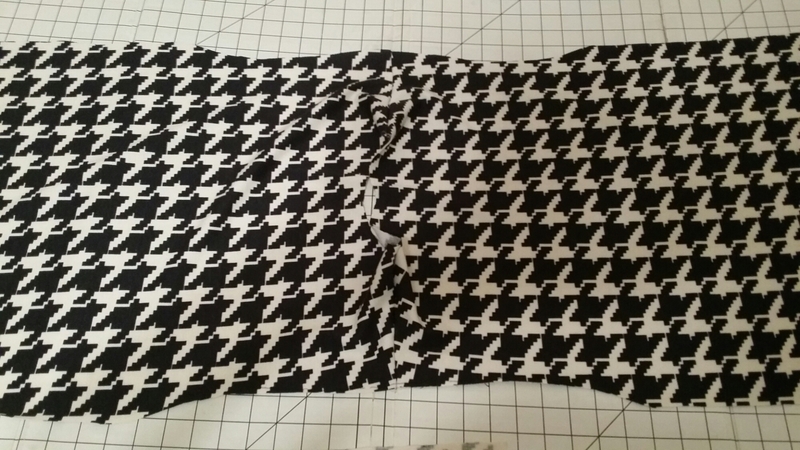 Now it’s time to attach the sleeves. Open the dress up like so. Attach your sleeve like so. 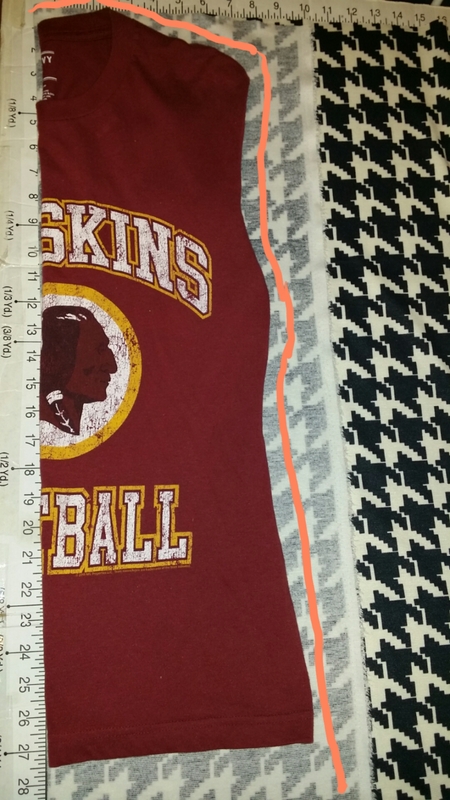 And sew using a stretch stitch or small zig-zag with a 1/2″ seam allowance. 7. 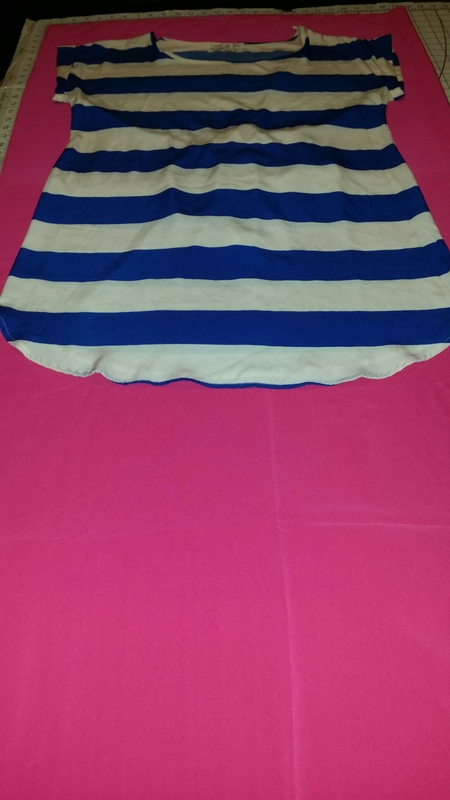 Now fold the dress with right sides facing. 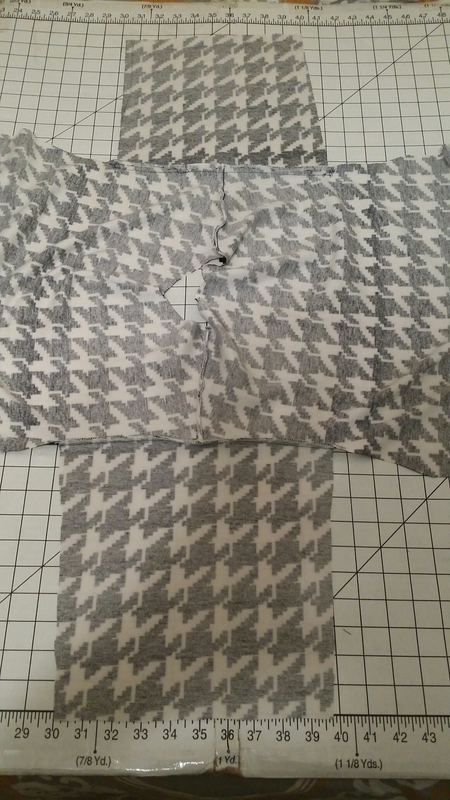 Sew using a 1/2″ seam allowance with a stretch stitch or small zig-zag stitch and finish the seams. 8. 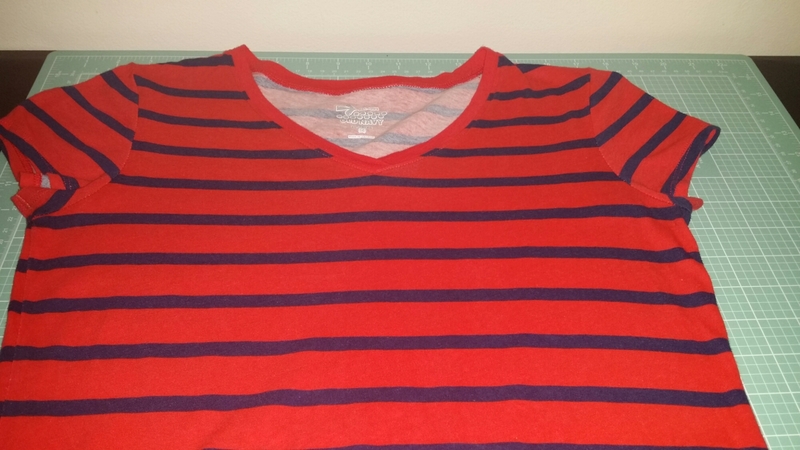 Hem the neckline by folding over 1/4″ and then 1/2″. 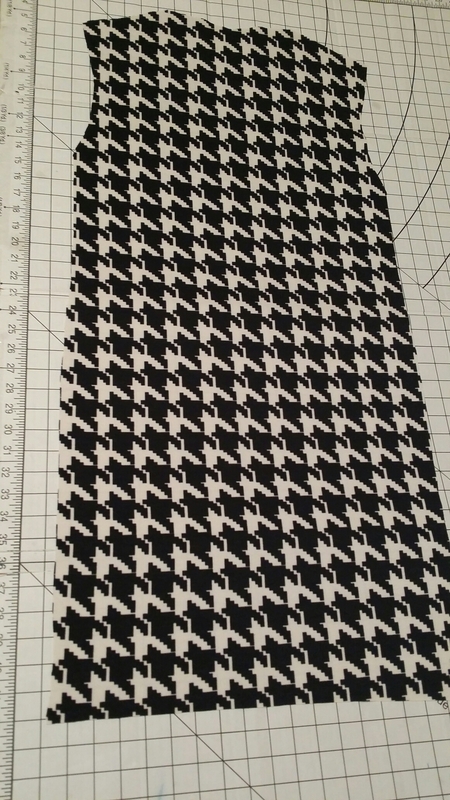 Stitch with a stretch stitch or small zig-zag stitch. 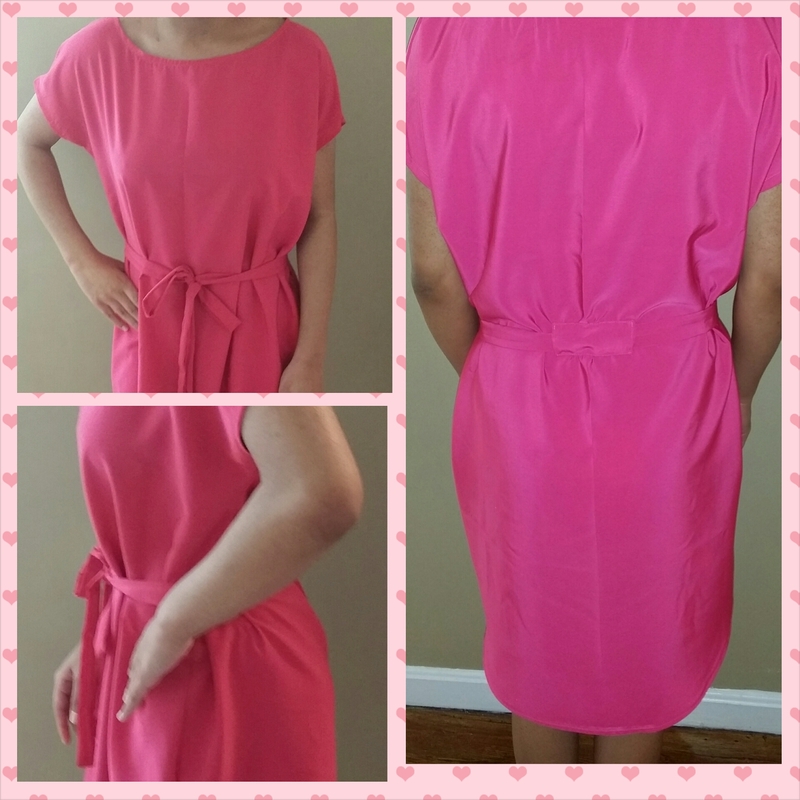 Hem the bottom of the dress by folding over 1/2″ and fold over again 1/2″ sew using the stretch or zig-zag stitch. Now you’re ready to wear and style. 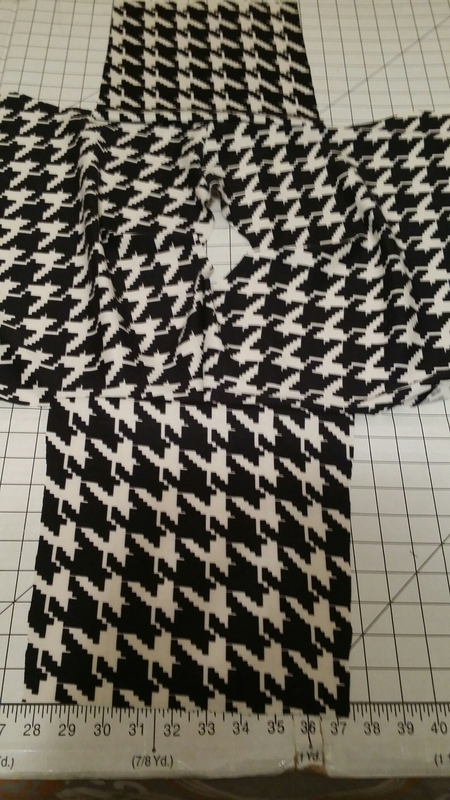 I purchased the Ponte De Roma hounds tooth fabric from GirlCharlee.com. 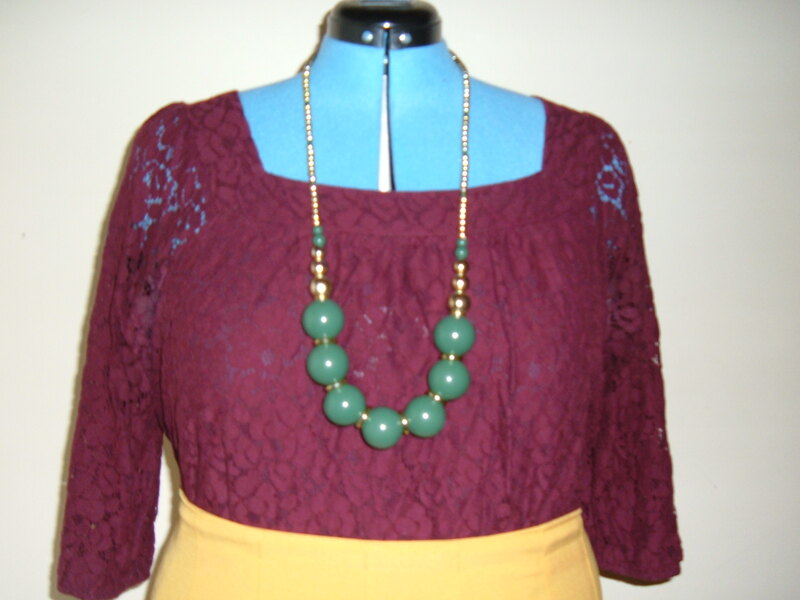 This particular fabric is sold out but is is available in brown, coral & forest green. Thank you for taking the time to stop by, I greatly appreciate it! A few weeks back I was shopping with my daughter’s. My oldest is a breeze to shop with. She loves shopping and always finds thing’s she loves. My youngest hates shopping for long durations and rarely finds thing’s she really likes……. the struggle. Thankfully on this outing she finds a dress in store # 2. 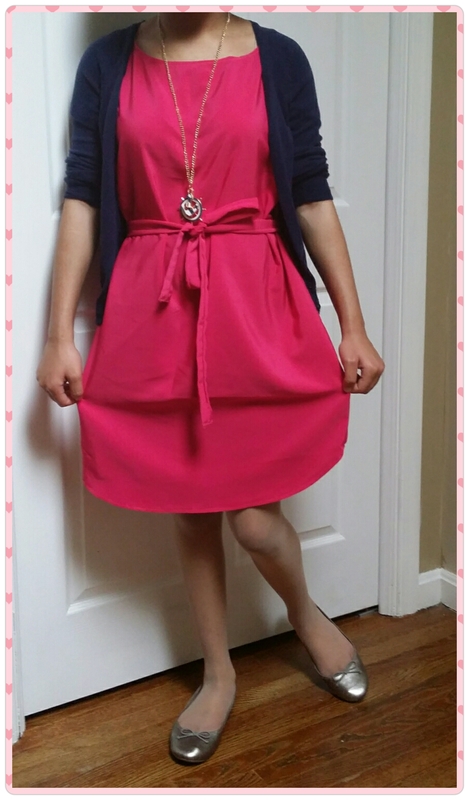 She tries the dress on and the fit is perfect. She loves loose and flowy clothing…..in her words I don’t like to be squeezed. Meaning nothing that hugs her to tightly. She is all about cute and comfortable. So both girls get what they want and wear the dresses they picked to an upcoming event, we were attending. 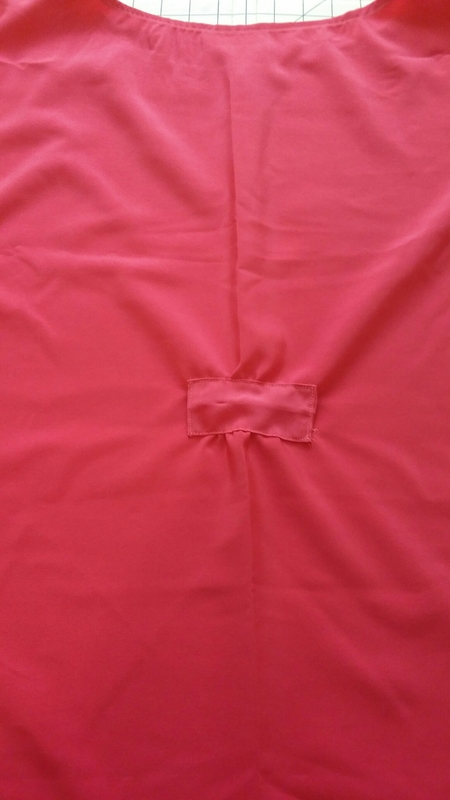 A few weeks later, I was cleaning out my fabric stash and find a yard and a half of Fuschia Peachskin fabric and it hit me…. why not make my youngest a dress like the one she recently got. So that’s exactly what I did and here’s how. 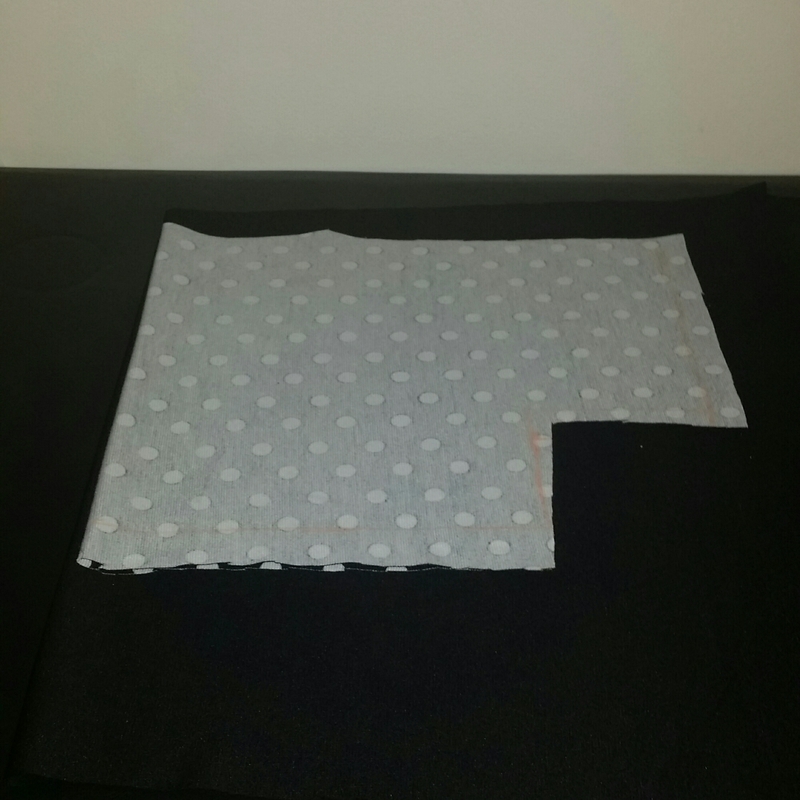 Fold your fabric in half right sides facing. 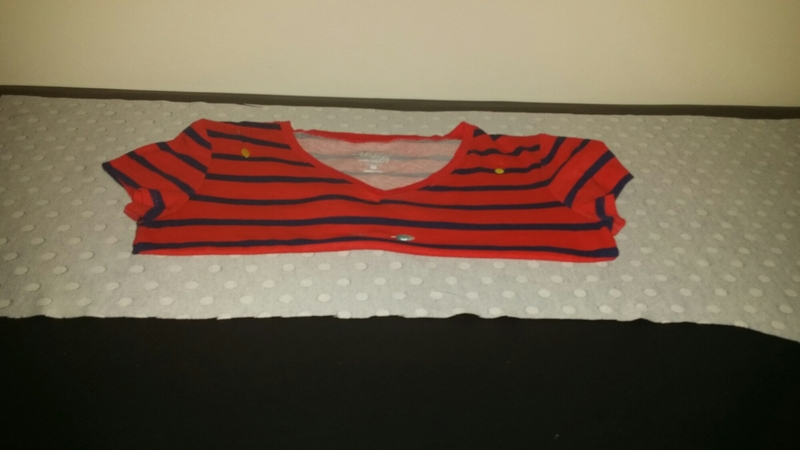 Lay your dress or t-shirt on top. 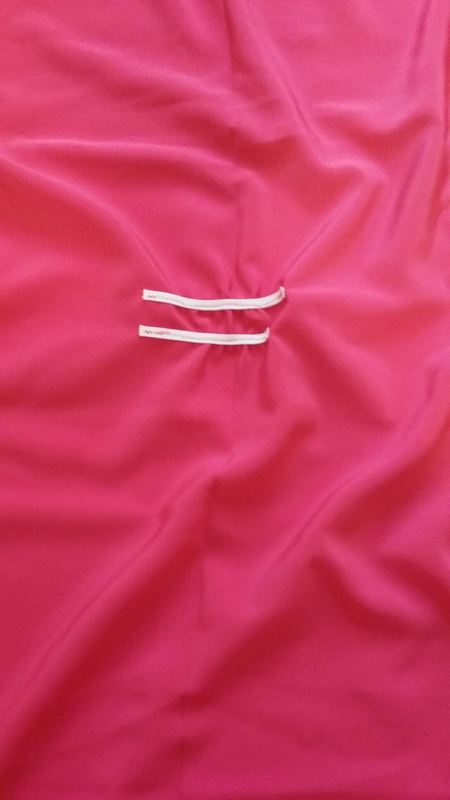 Now pin and sew using a 1/2″ seam allowance. 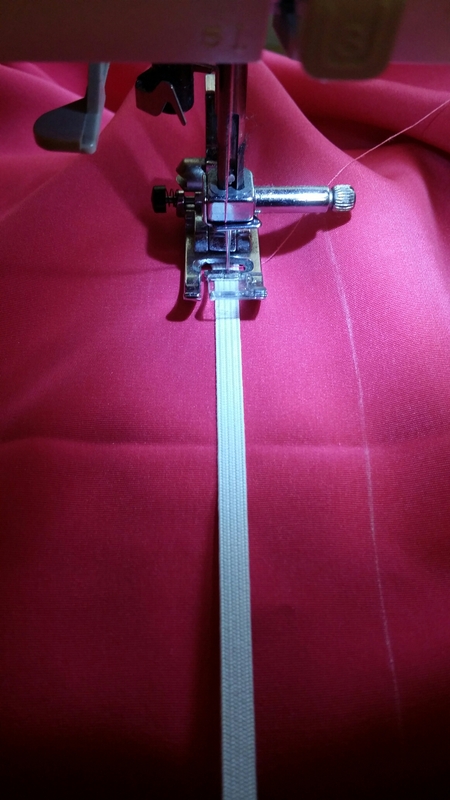 Finish you seam with a serger, zig-zag stitch or pinking shears. 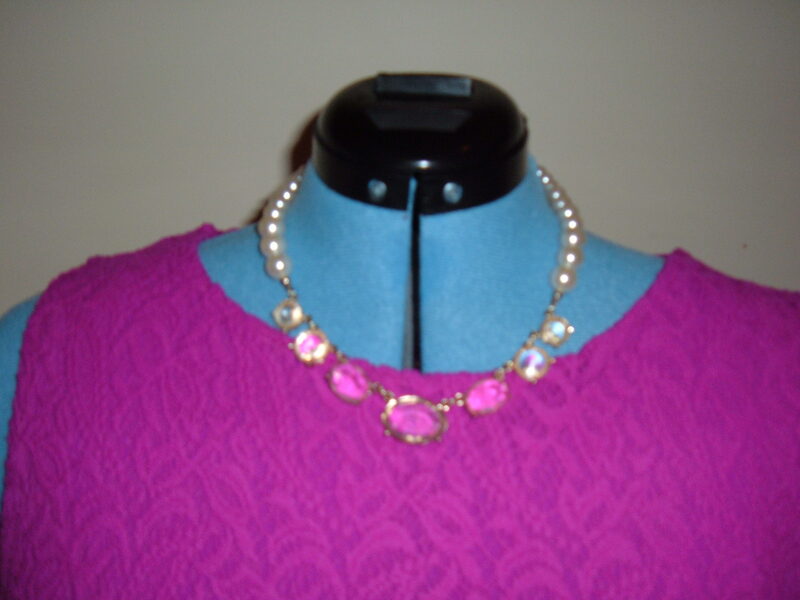 Try your dress on and mark where your would like your neckline. 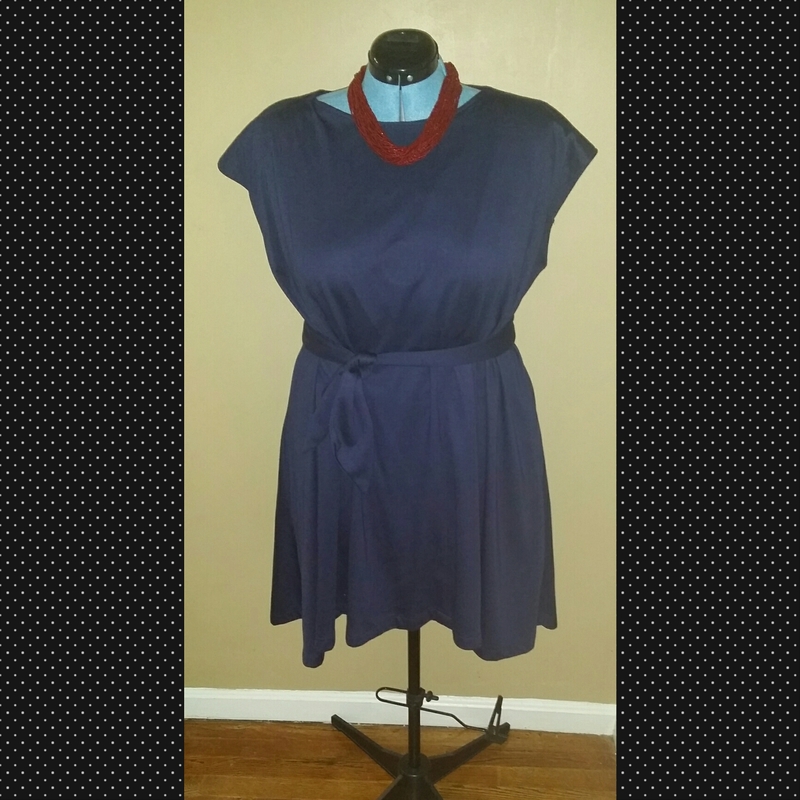 Remove the dress and now mark 1″ above your desired neckline mark. 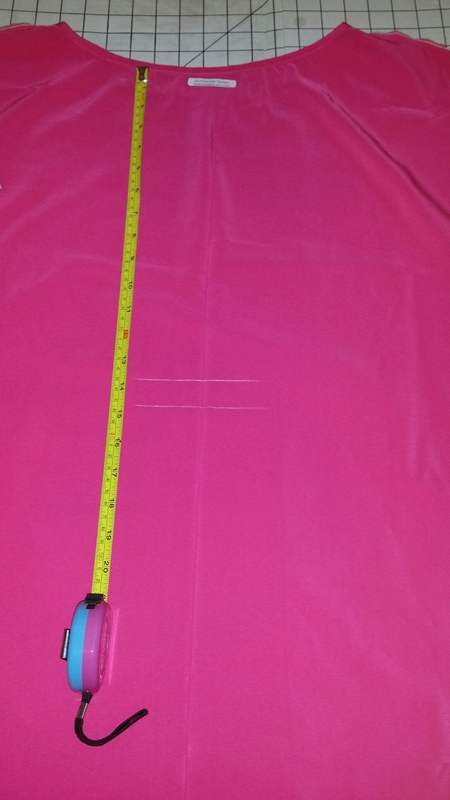 Cut the neckline only on the fabric that will be the front of your dress. 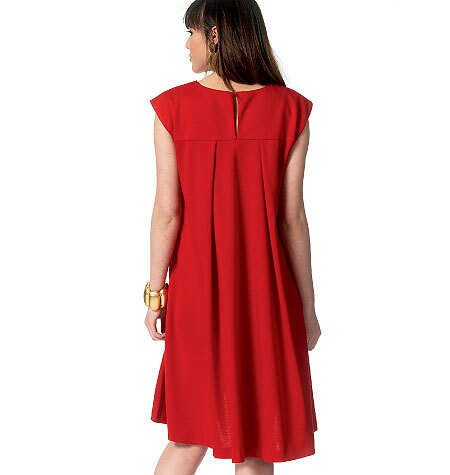 At the 1″ mark, that’s above your desired neckline. Now give all your seams a good press. 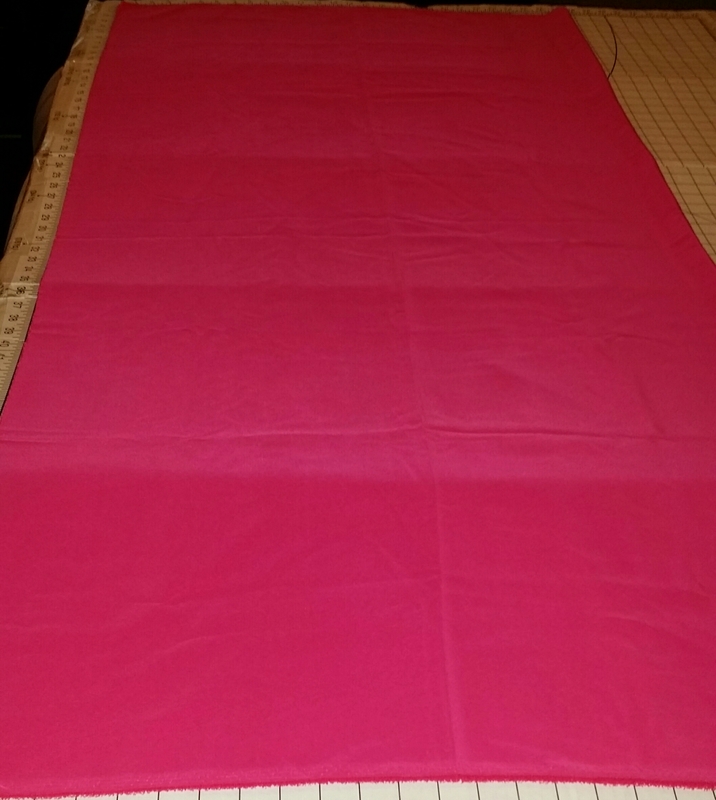 With your leftover fabric, cut 2 strips of fabric 3″ width x 37″ length. ( Feel free to add more to the length if needed. 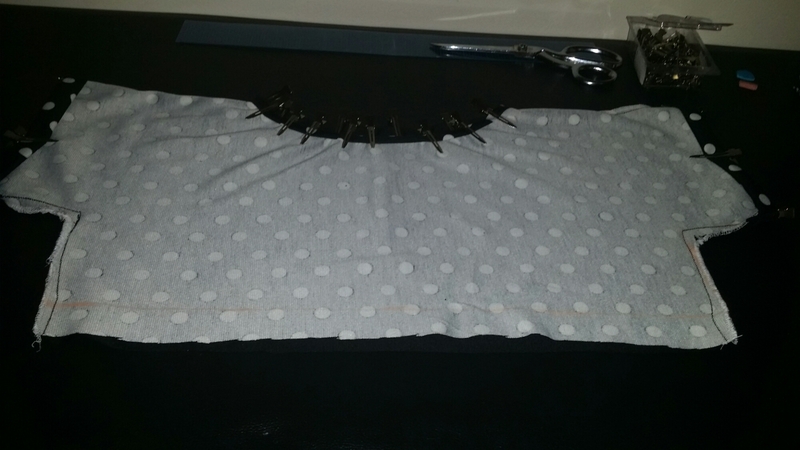 This is going to be the sash/belt for your dress). 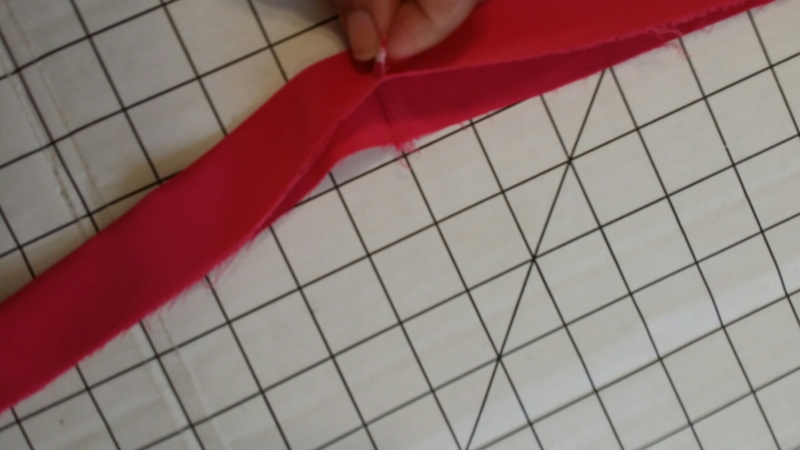 Lay the strips on top of each other with right sides of the fabric touching and sew 1/2″ seam on one short edge and finish the seam as desired. Now you will have one long strip. 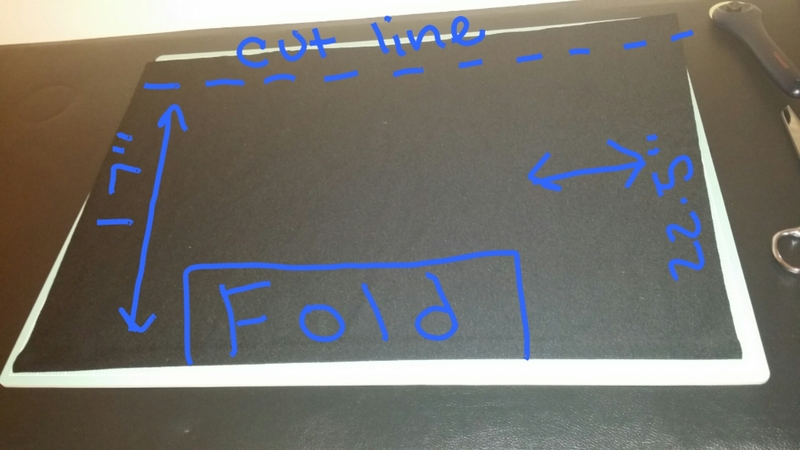 Press out the strip and fold it in half lengthwise. 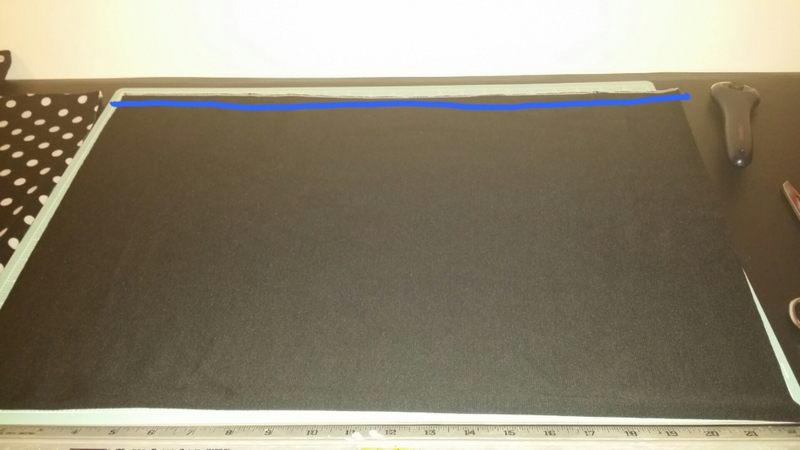 Sew 1/2″ seam down the long strip. 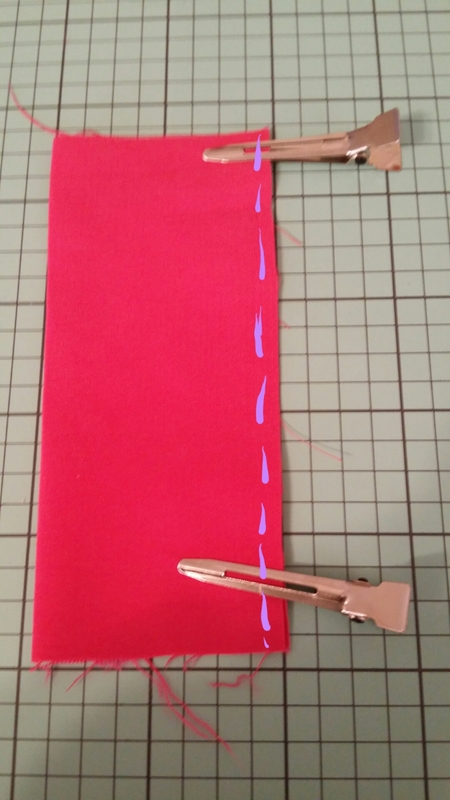 Turn your long sash/belt right side out and give it a good press. 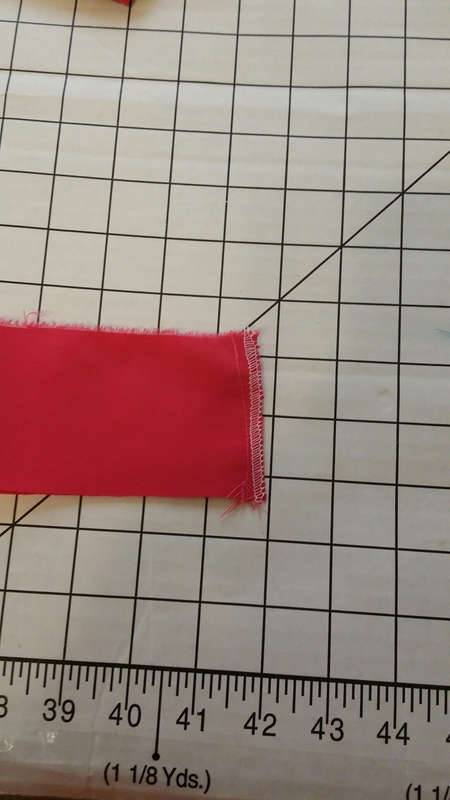 Turn in the edges 1/4″ and topstitch close to the edge. Set the sash / belt aside for now. Cut out a 5″×5″ piece of fabric. 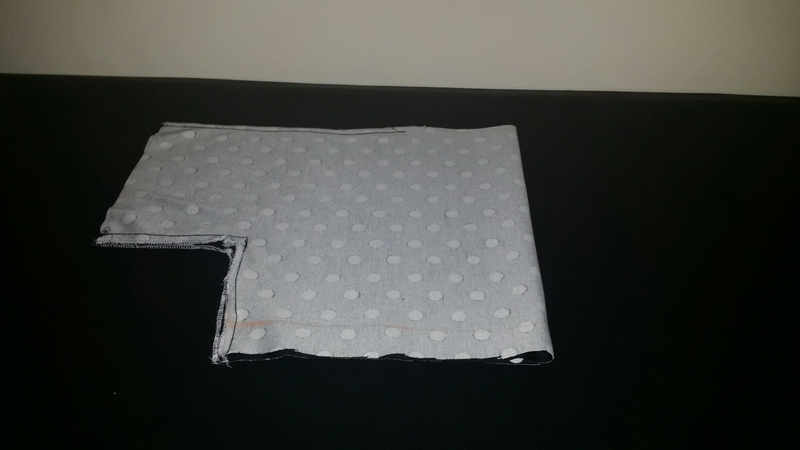 Fold in half lengthwise right sides facing and sew with a 1/2″ seam allowance. 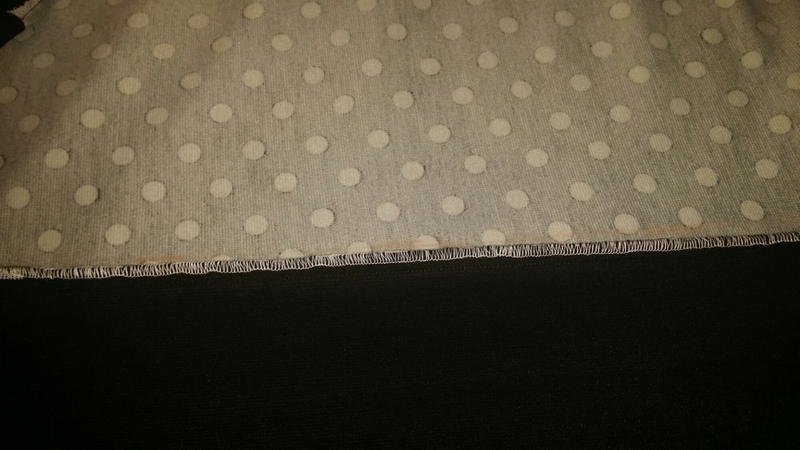 Turn the fabric right sides out and press with the seam in the center. 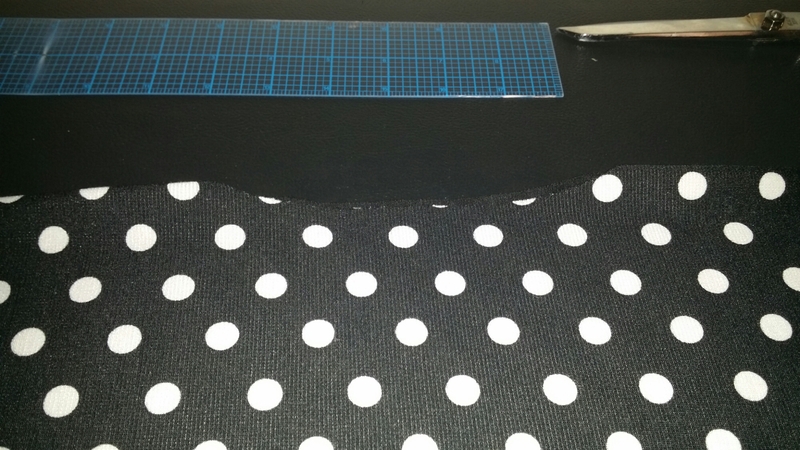 Fold the short edges 1/4″ and top stitch on the edge. Set this piece aside for now. Now with your dress turned to the wrong side and the back facing you. 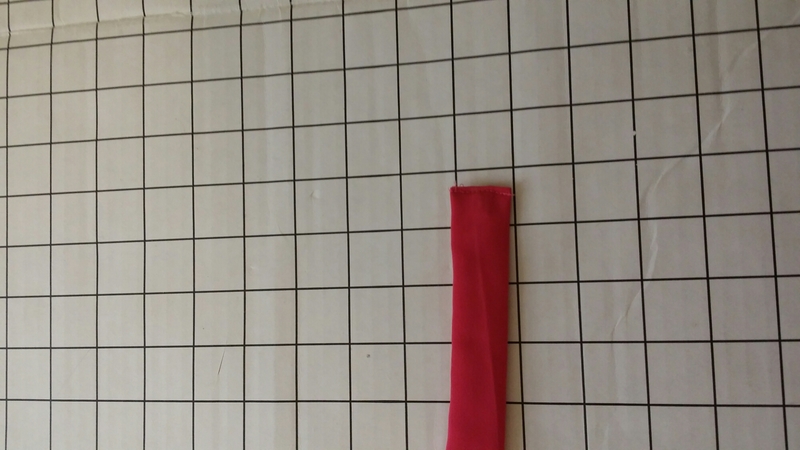 Measure down 15″ and across 4″ and draw a line. Then make a line 1″ above this mark like so. 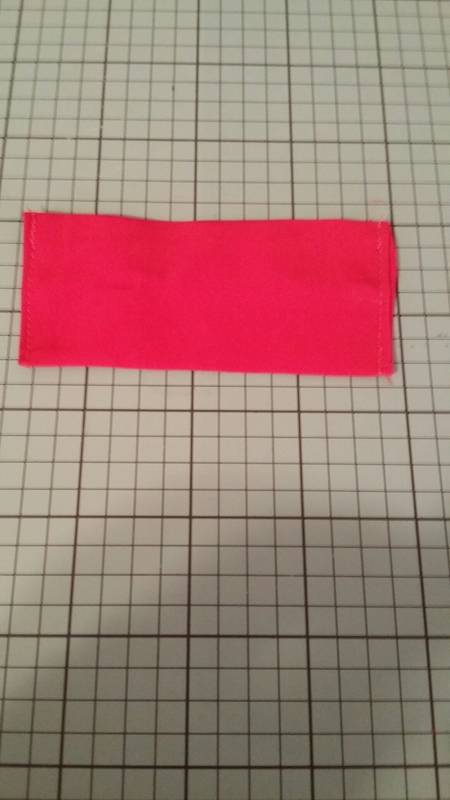 Cut (2) 1/4″ elastic pieces 3″ in length. 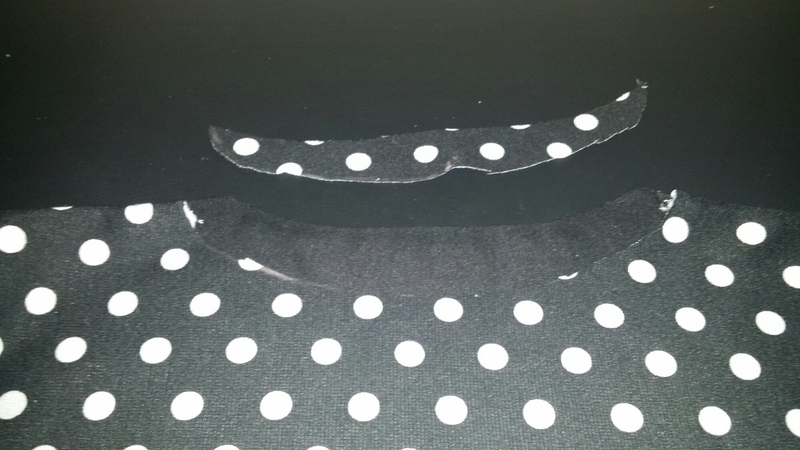 Attach to your dress on each of the lines with a zig-zag stitch making sure to stretch the elastic as you sew. 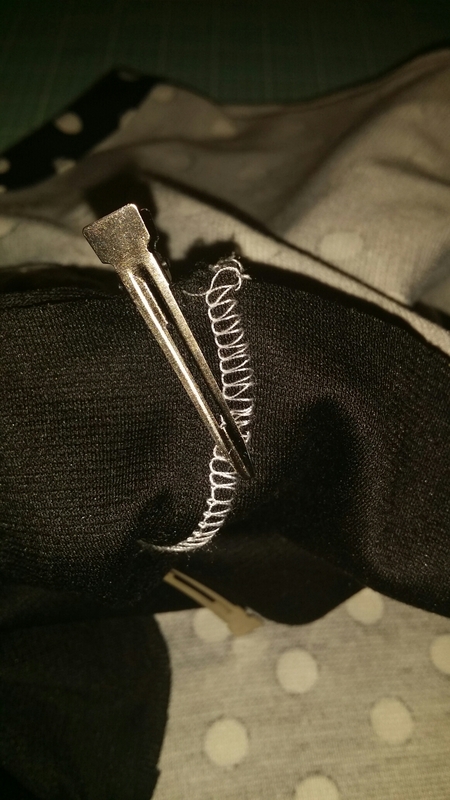 Be mindful that your only sewing the elastic on the back of your dress. Now turn your dress right sides out. The back facing you. 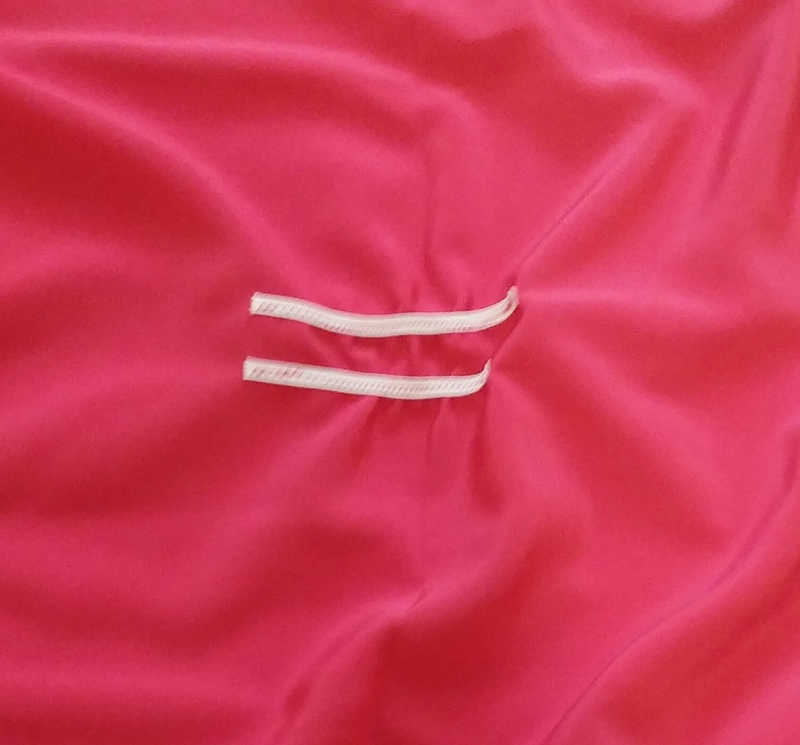 You will see a little gathering affect from where the elastic was sewn. 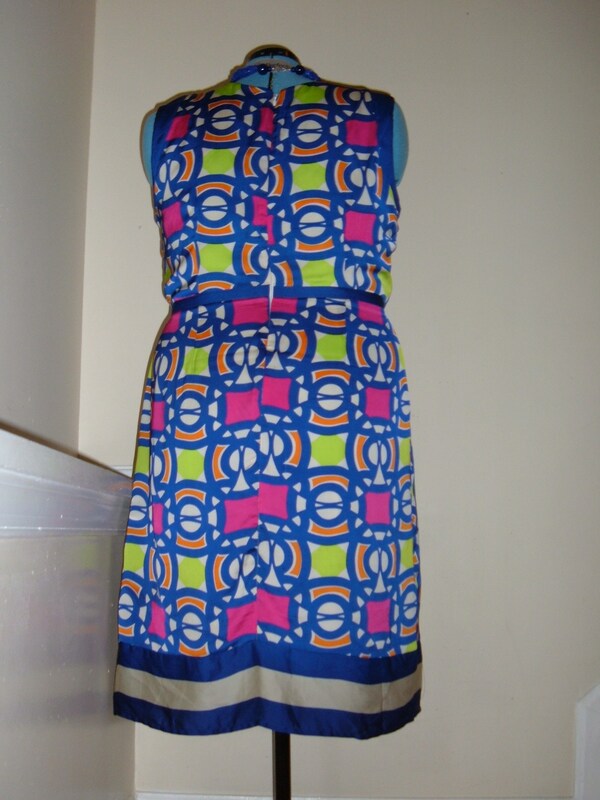 Now get the small tube we sewed earlier and pin it over the gathering like so. Sew across the top and bottom long edges only. When done it will look like this. Now pull your sash/ belt through. Now you’re ready to wear your dress. Great all year around. Add a cardigan and boots/booties, ballet flats, heels for the fall/winter months and of course for summer and spring great sandals. Please feel free to message me with any questions you may have. I’m excited to share my latest project with you. 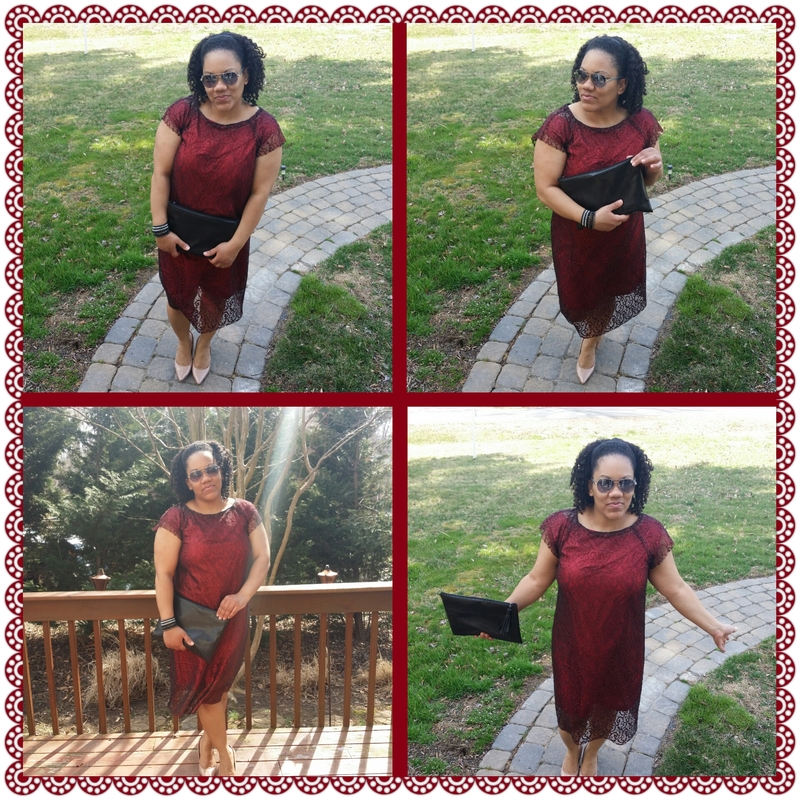 I have been obsessing over this dress for quite a while….even in my sleep…lol. You know you really love something when you just can’t get it out of your head. 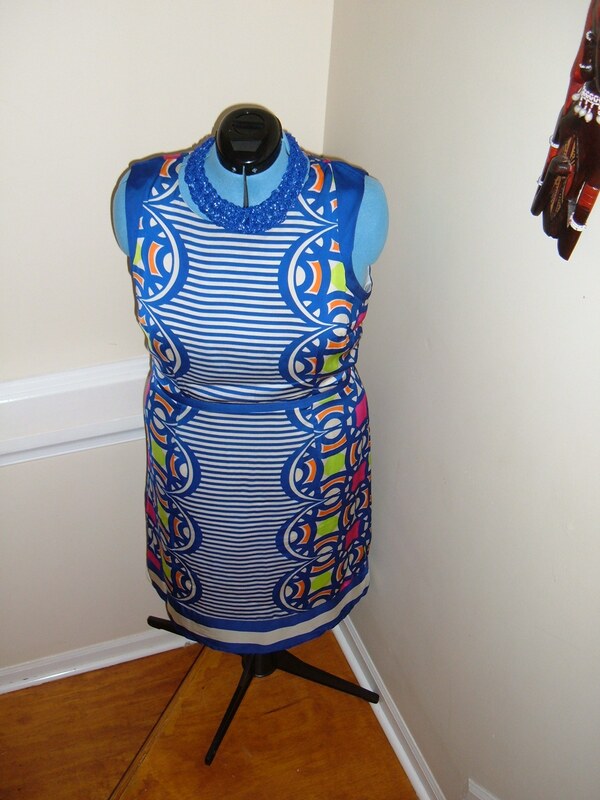 This dress is inspired by Project Runway Allstar’s Designer Sonjia Williams and Pinterest. Now, all I needed to do was…… figure out how to get my vision to come to life. 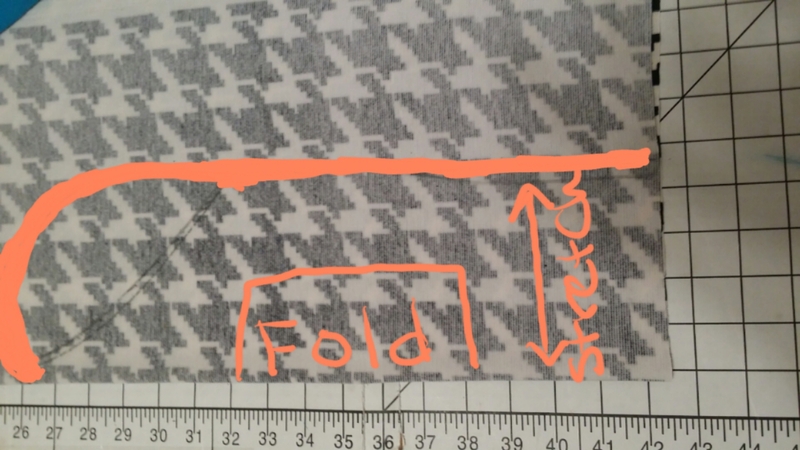 So I started looking online at dress patterns. I found one that might work, but it wasn’t exactly what I had in mind. So, I kept searching and finally I came across what I was looking for. Simplicity New Look Pattern 6225 View C.
To make this pattern into a dress, I simply added 12″ to the length. 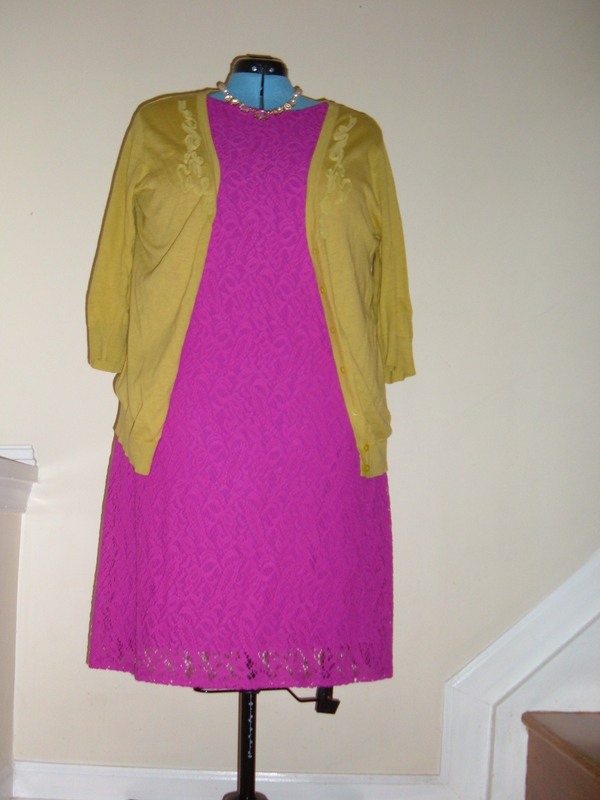 Since I used lace I did not hem the capped sleeves or the hemline. 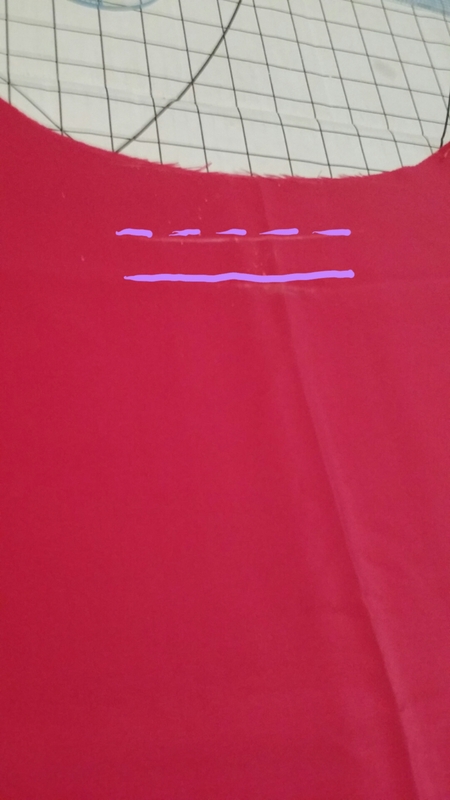 I created a dress using a red-ish silk fabric to go underneath. 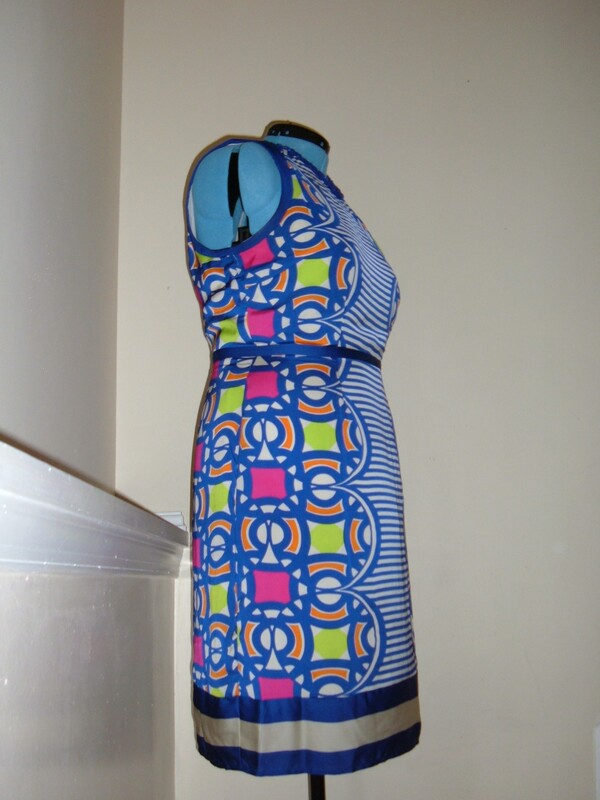 I simply used a sleeveless dress from my closet as the pattern. I have a tutorial here which shows the method. In the end, I was very pleased with how everything came together. It’s nice to see inspiration and what you envision come to life. It feels like a dream come true. Thank you for taking the time to stop by, I greatly appreciate it. 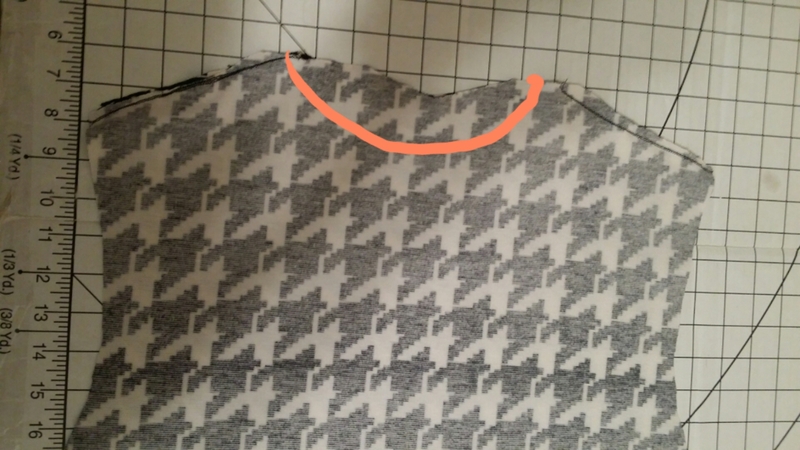 Is there anyone else who finds sewing pattern’s challenging???? I have a few half completed projects. Simply because I have no idea what the pattern requires. I have to confess some times I am just too ambitious for my sewing skill level. 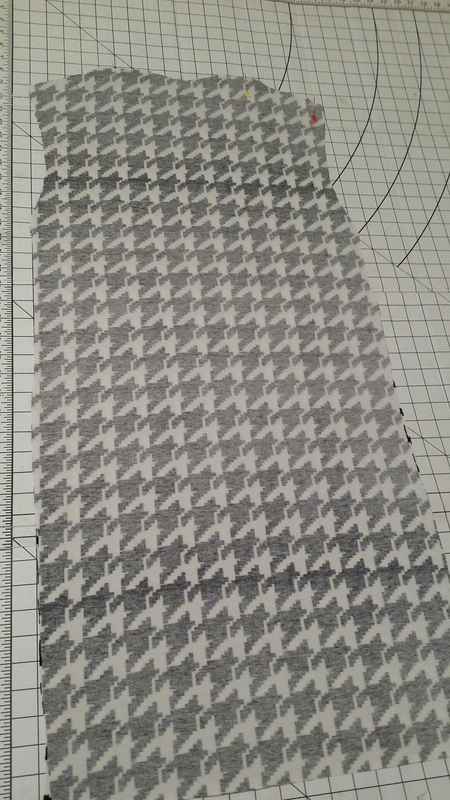 I see a cute pattern and say “oh I have to try and make that”…… only for it to end disastrously…..lol. 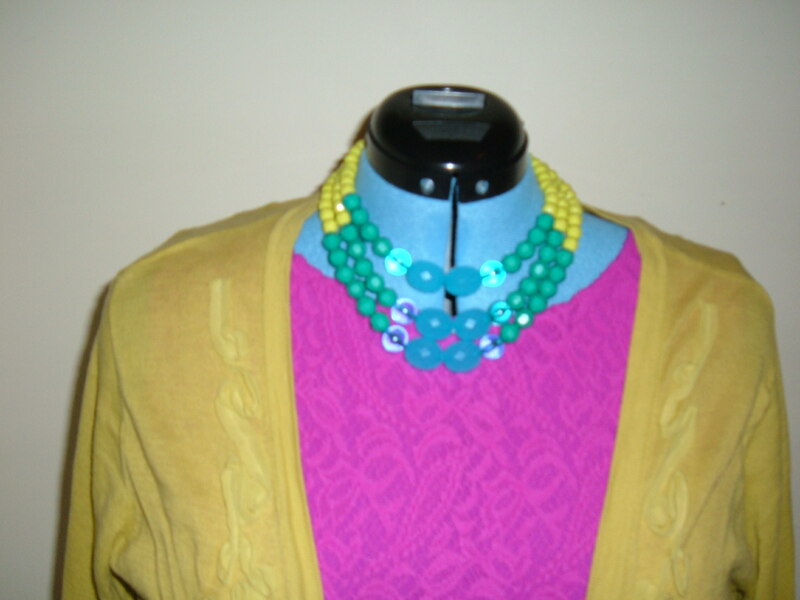 So instead of taking a negative approach(banning patterns for life)….I decided to ease my way into thing’s. I will say, that this approach is working well. I didn’t have any angry outburst nor did I feel like a failure. 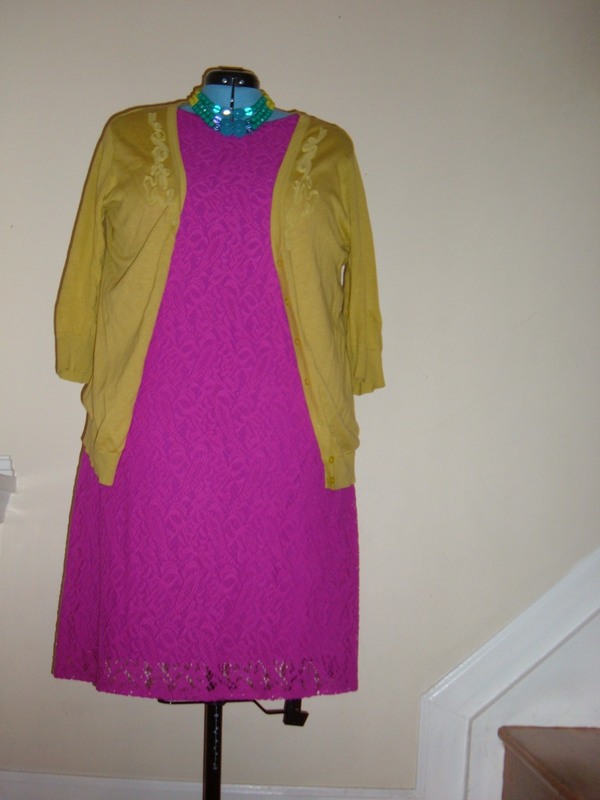 I completed the garment and even made a few small modifications to suit my needs. For this dress I used New Look Pattern 6298 View D.
I used a jersey knit with a prism square design from GirlCharlee.com for front and sleeve’s similar here and a solid black double knit for my back piece from my local Hancock Fabric’s. • Used a contrasting fabric for the back. • I did not add the hem band. 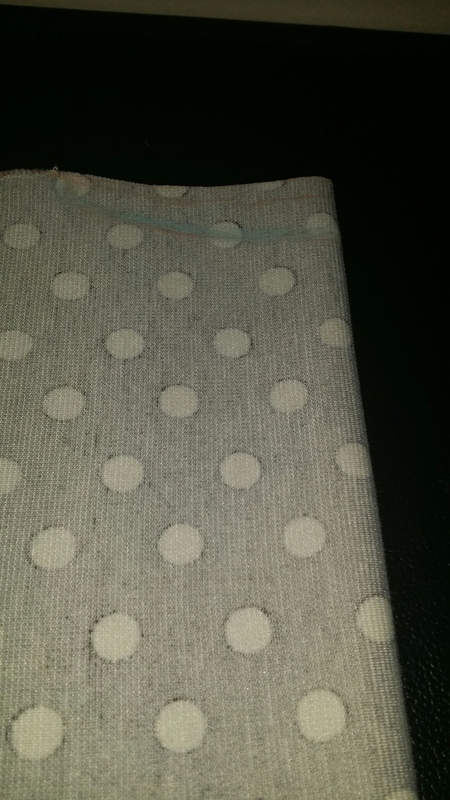 Sewed with a twin needle for the first time. 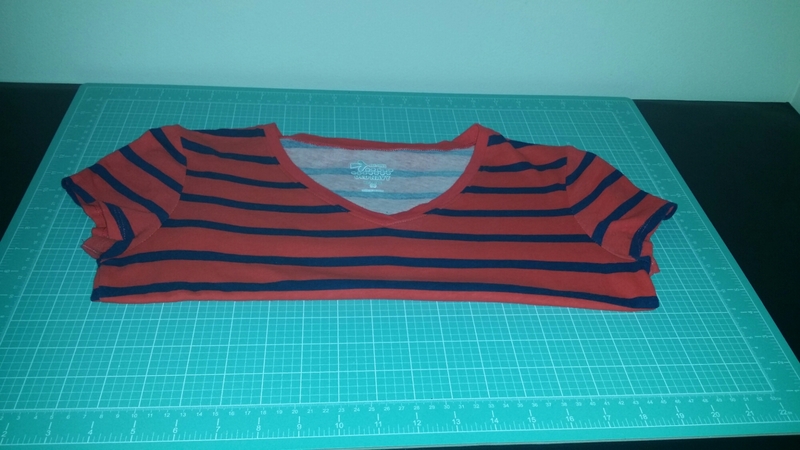 Which was very easy and now I wonder…..why have I not been sewing knits this way all along????….lol. 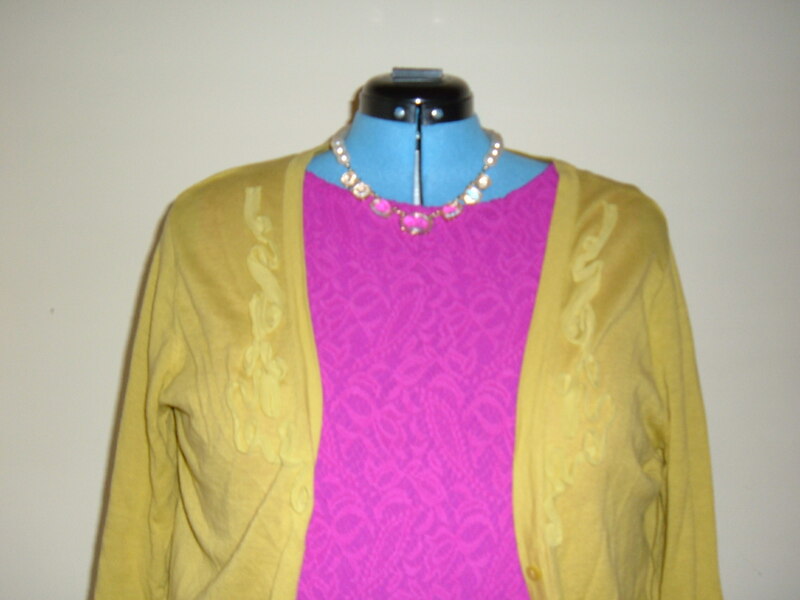 The pattern was very easy to follow and my garment looked as pictured. So this was my weekend to get some sewing projects completed. I can officially remove one from the list. I also noticed that my daughter’s keep finding things for me to make for them. I have to do something about that….lol. 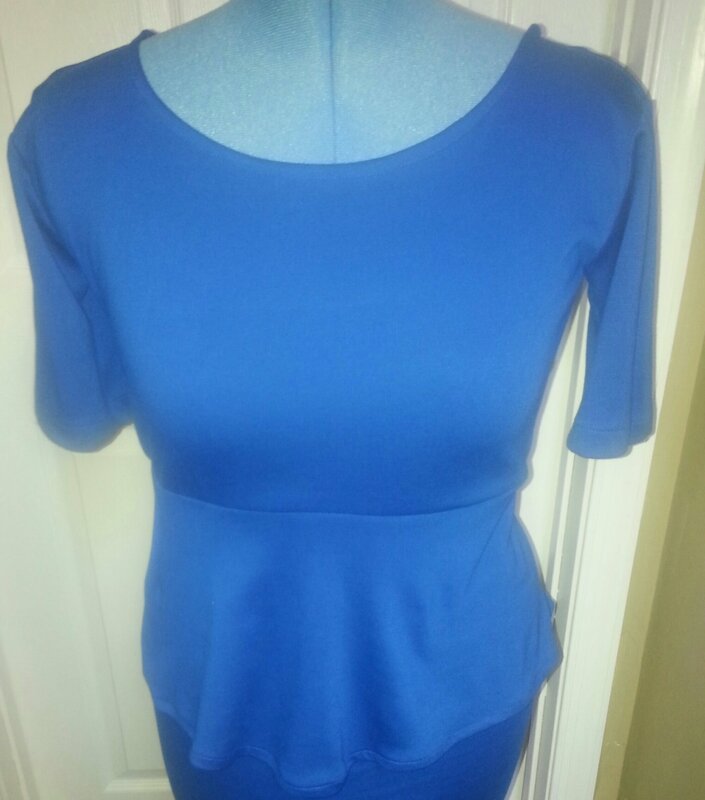 Onto the fishtail peplum dress. It took me 3 hours to complete……..because I was doing, laundry, cleaning and cooking dinner in between. 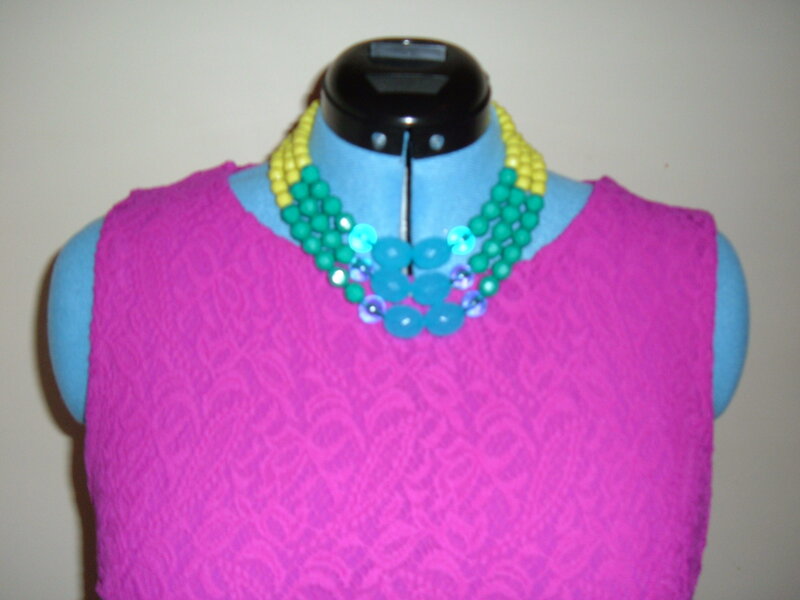 My model bailed on me aka my 13-year-old….so I had to use my mannequin. The tutorial was pretty easy to follow. It allows you to add your personal touches. I will certainly try this again. 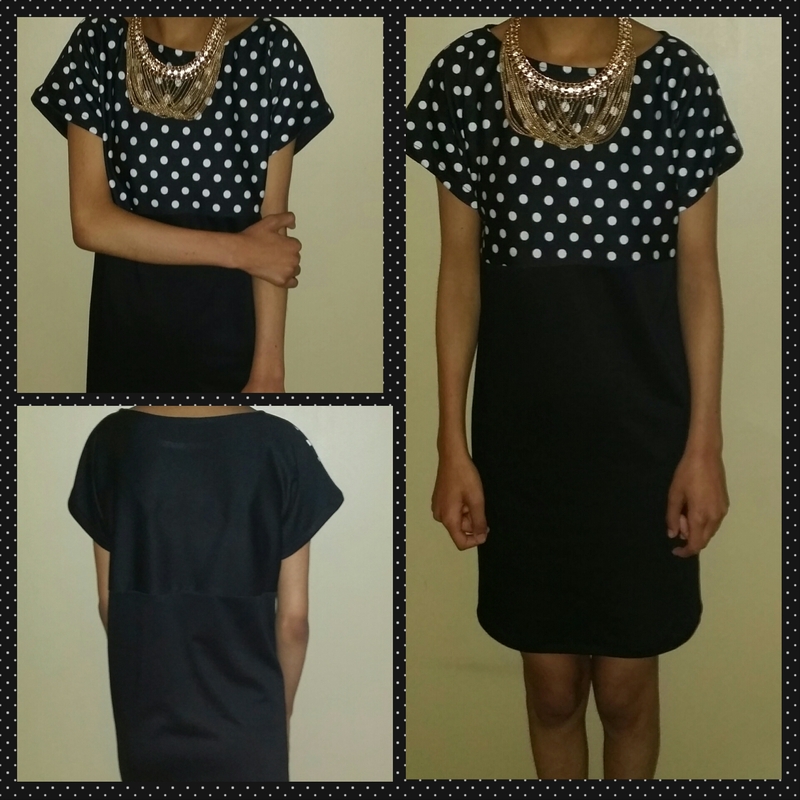 To make this dress check out the video below. Thank you c/o of DIYMeesha for the video. Back in the Fall of 2012. I was going to an event an I really wanted to make the outfit I was going to wear. 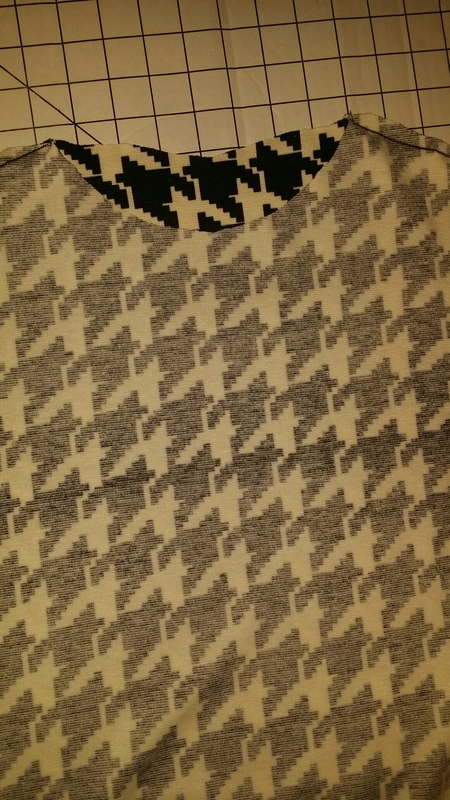 So one day while in Hancock I found a pattern, that I thought would be perfect. It is McCall’s “Fashion Star” Pattern MP228/ M6553 to purchase click here. So now that I had the pattern, I needed to find the fabric. 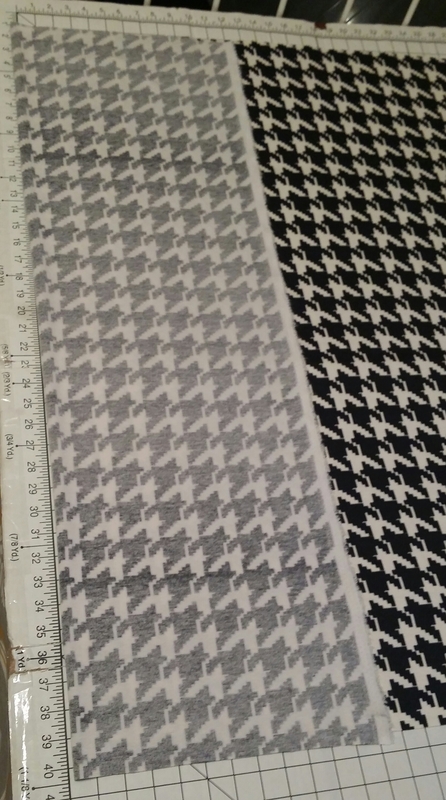 The pattern suggest a double knit…..along with some other options. I wanted a knit in Cobalt Blue. 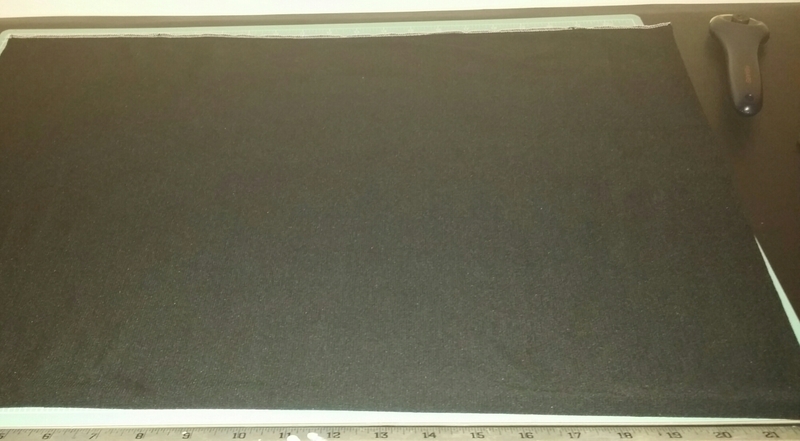 Since, I couldn’t find what I wanted I settled for a nice Navy Blue Ponte Roma Knit. Were the instructions easy to follow? 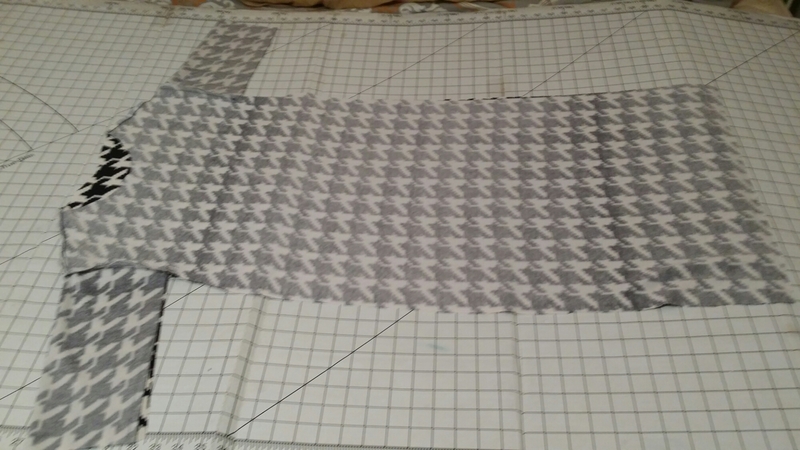 The instructions were pretty easy to follow….an I’m pattern challenged…lol. 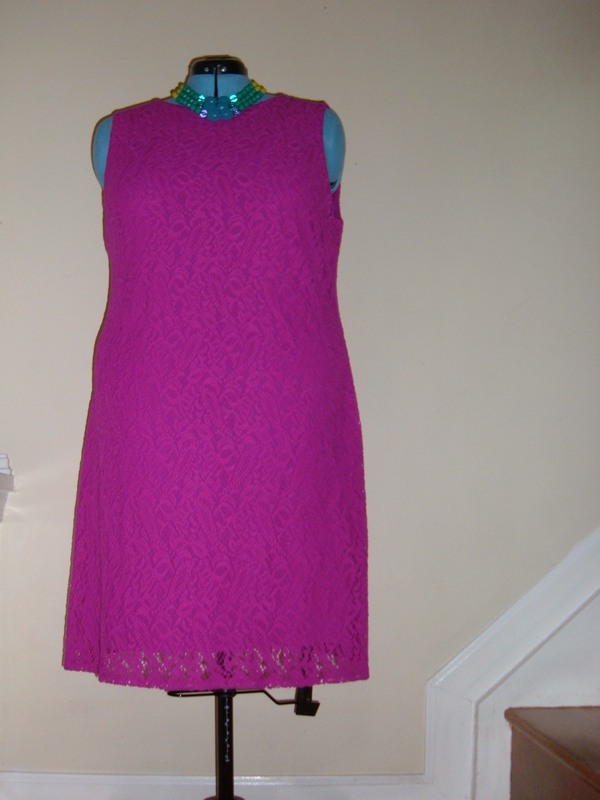 Pattern alterations or any design changes you made: The next time I work with this pattern, I would not use interfacing on the yoke back. I would like less stiffness/structure in this area. 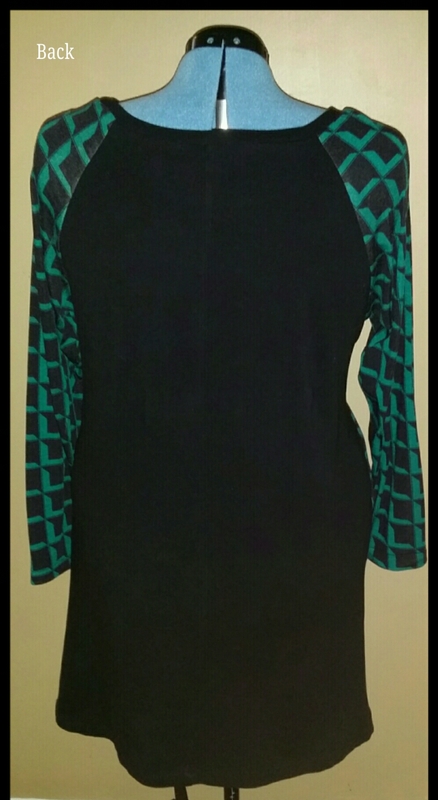 Pattern Description: Loose-fit, pullover dress with princess seams, side opening for self belt, self-lined yoke back back pleats/ neck slit with button/thread loop closing, and shaped hemline. 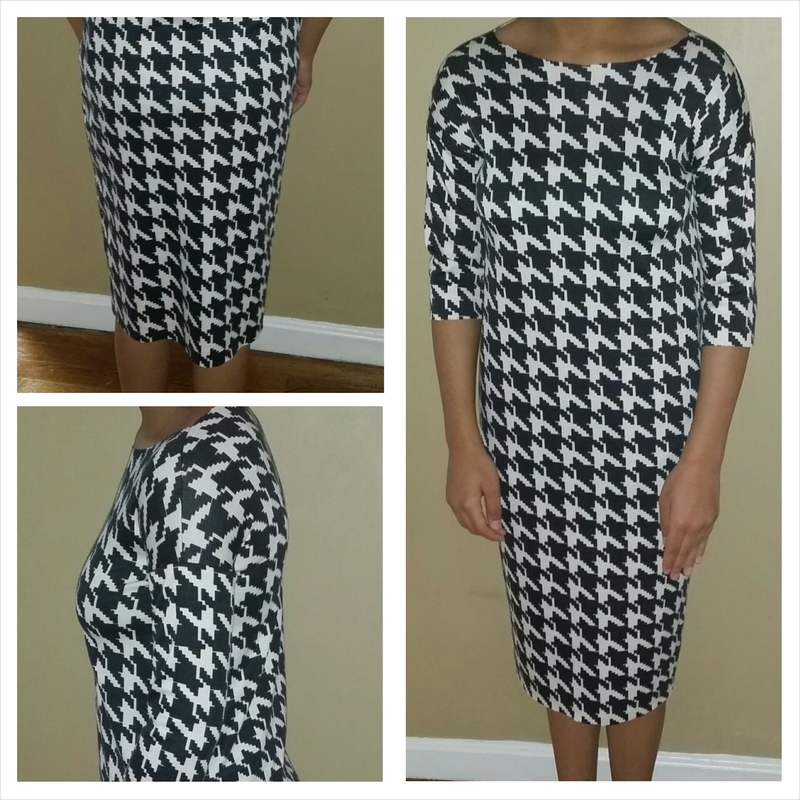 Fabric Used: Ponte Roma Knit (which is great because depending on how you accessories/style it, you can dress it up or down. 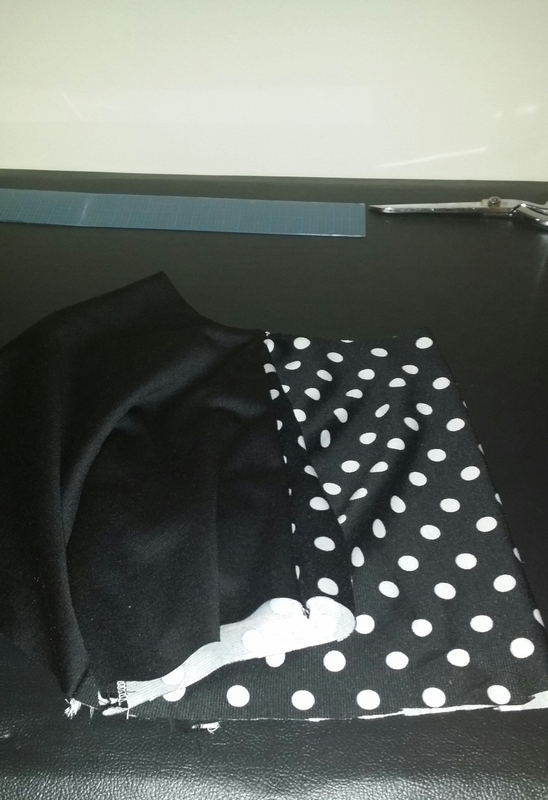 This fabric was really easy to work with and sews like a dream. 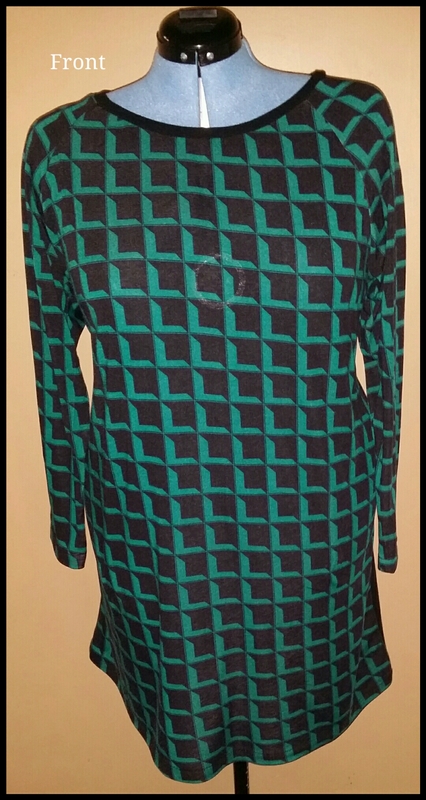 I highly reccommend this pattern because it’s easy to construct, not alot of pattern pieces, looks fabulous and the pattern offers other options like a high low top, color blocking and lenthening the hemline for a totally different look than the high low. 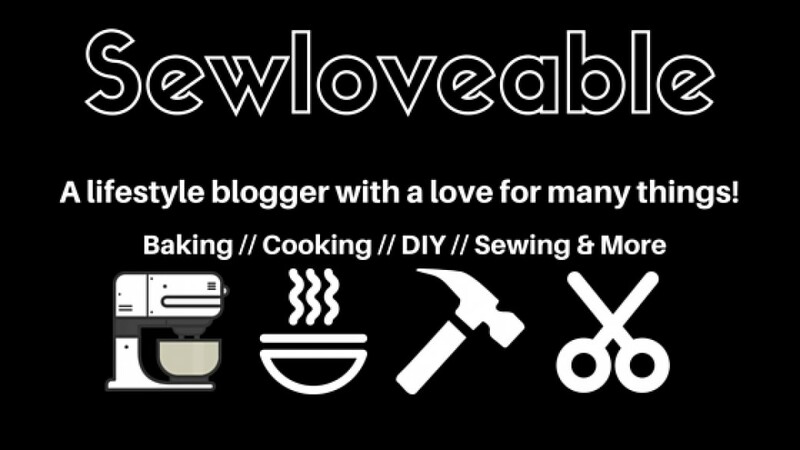 Feel free to check out one my favorite blogger’s MimiGStyle. 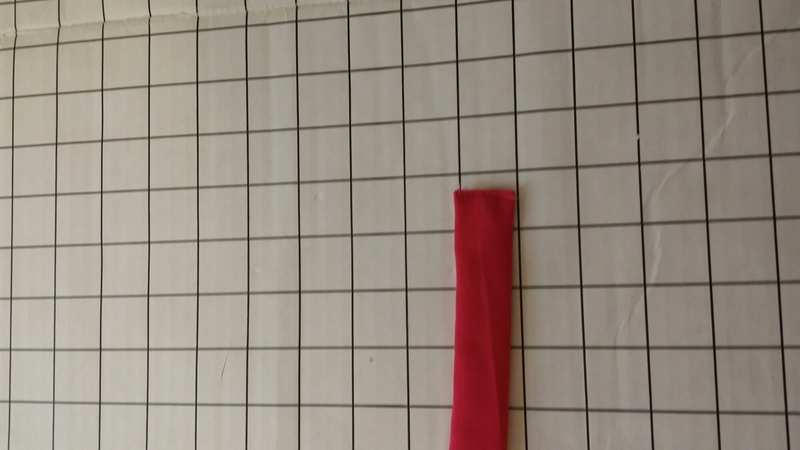 She did a great overview on this pattern in RED.